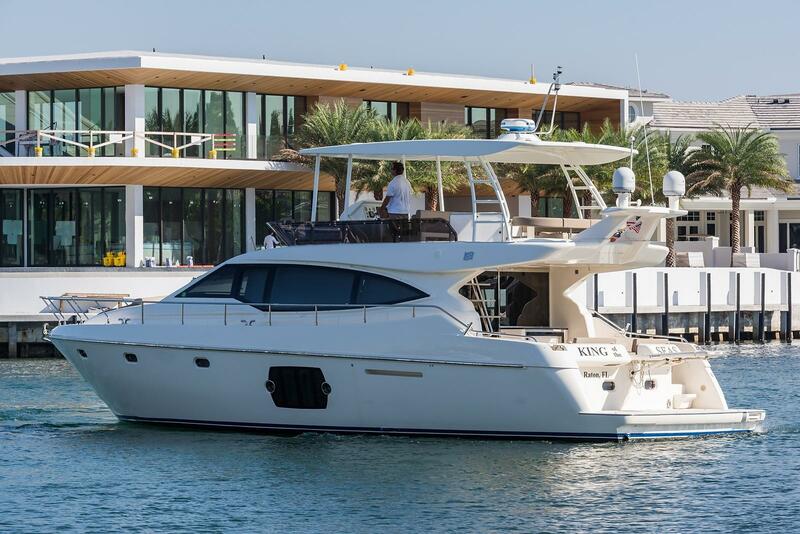 2010 Ferretti Yachts 510 "King of the Seas"
The 2010 FERRETTI YACHTS 51’ MOTOR YACHT KING OF THE SEAS is a beautiful FERRETTI 51’. 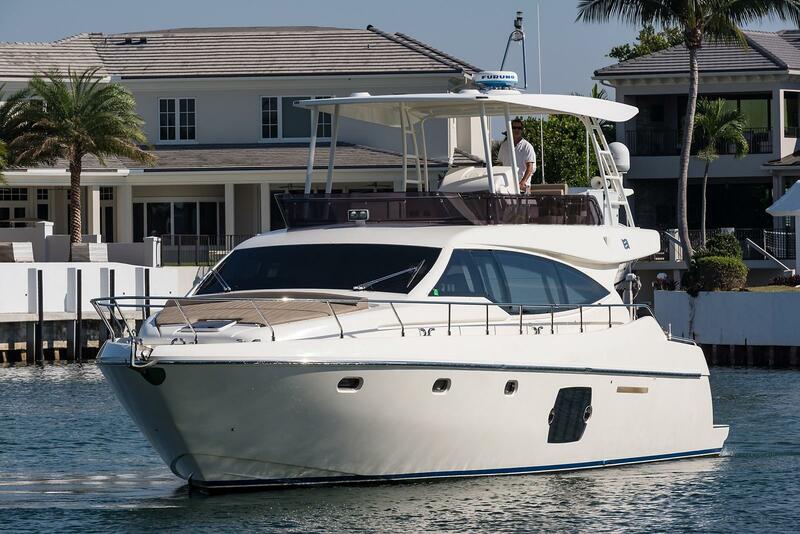 She has several rare options, including a hardtop on the flybridge and a “gyro” for stabilization underway. 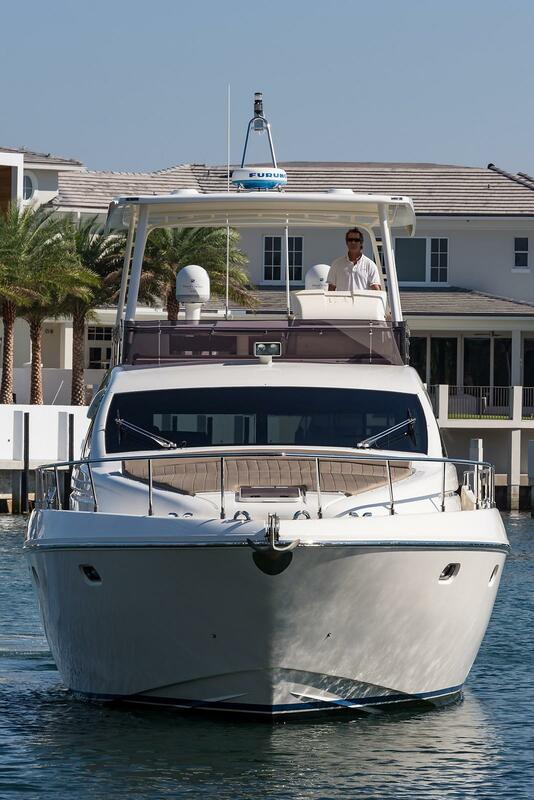 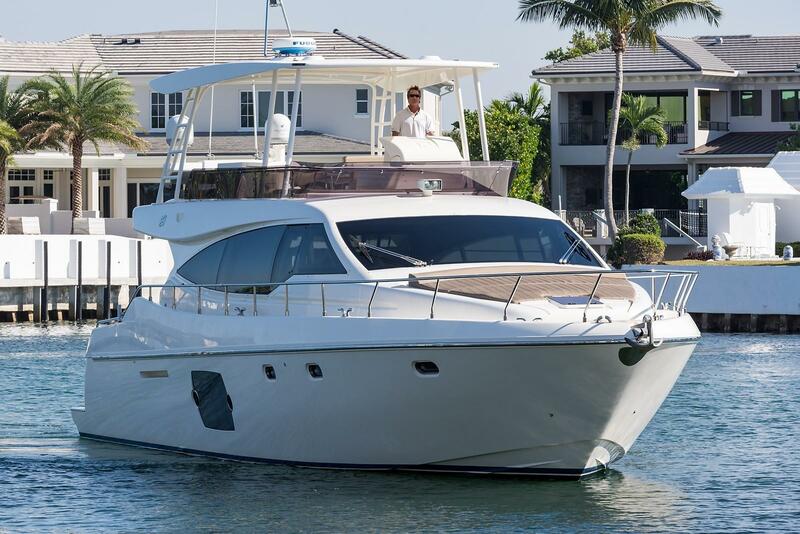 This captain-maintained 51’ MOTOR YACHT shows very well and has been kept with an open checkbook by the owner. 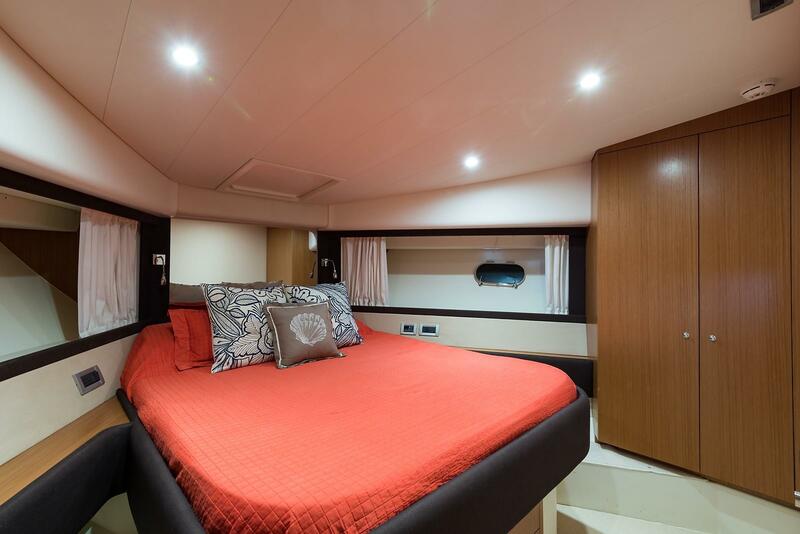 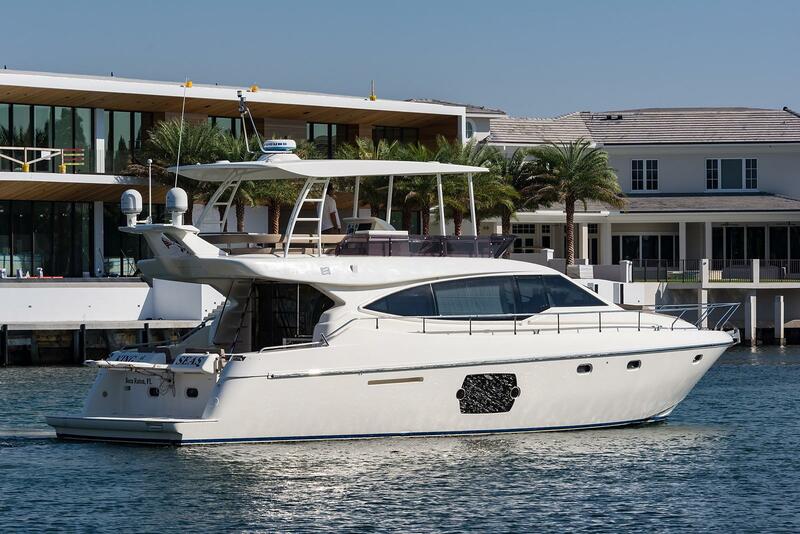 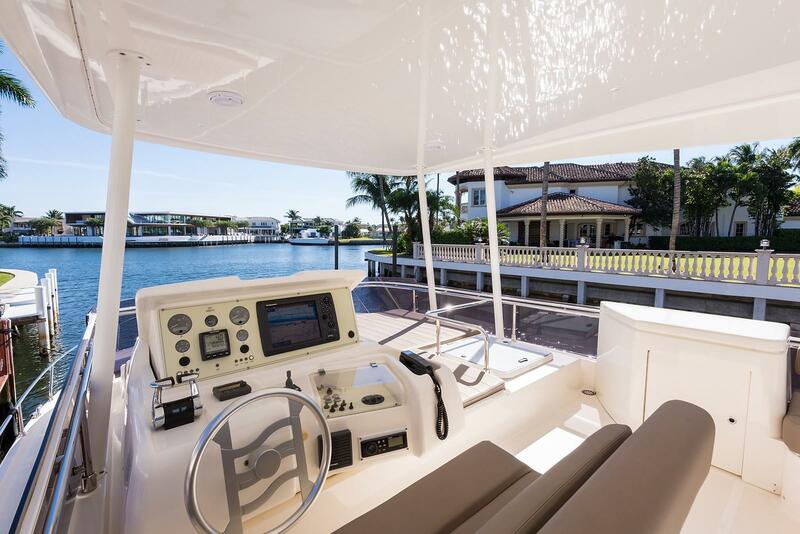 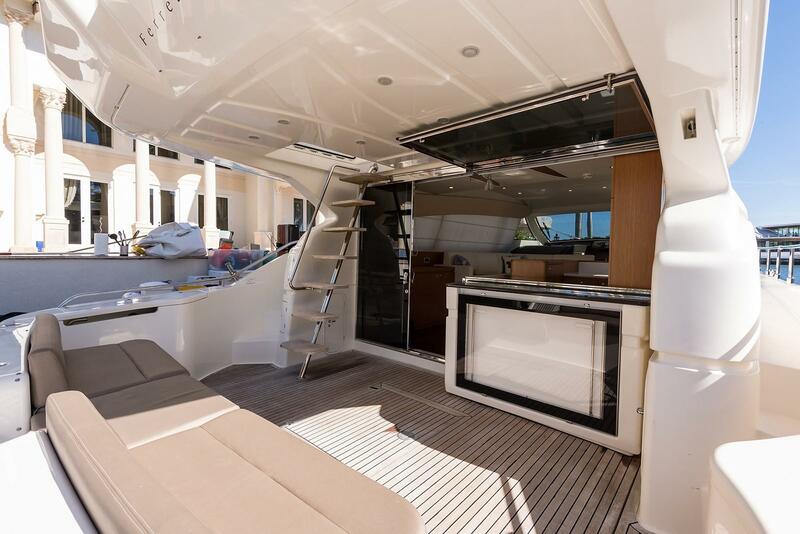 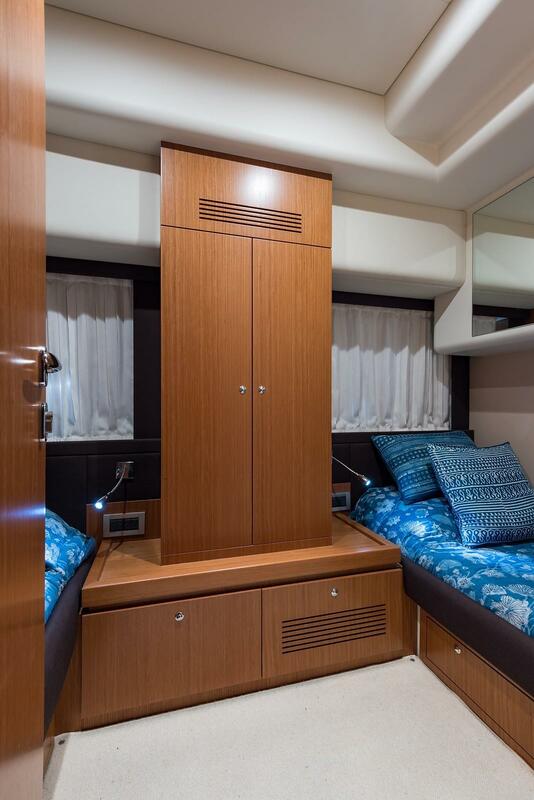 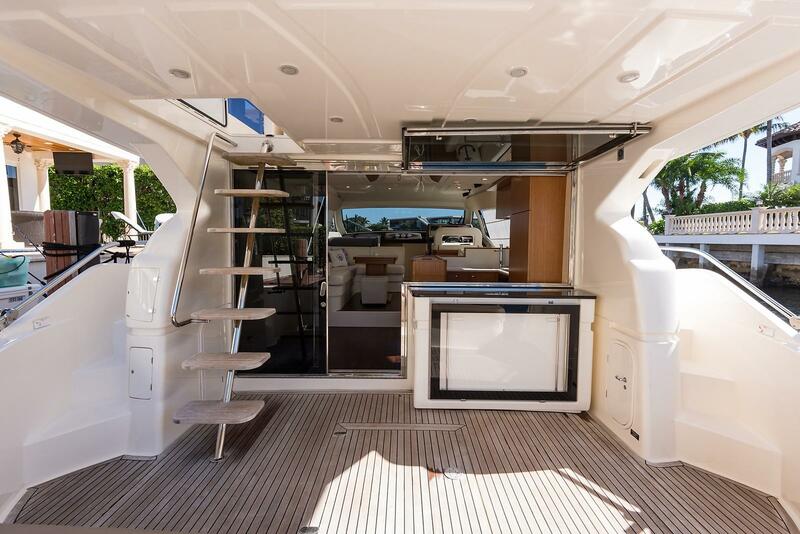 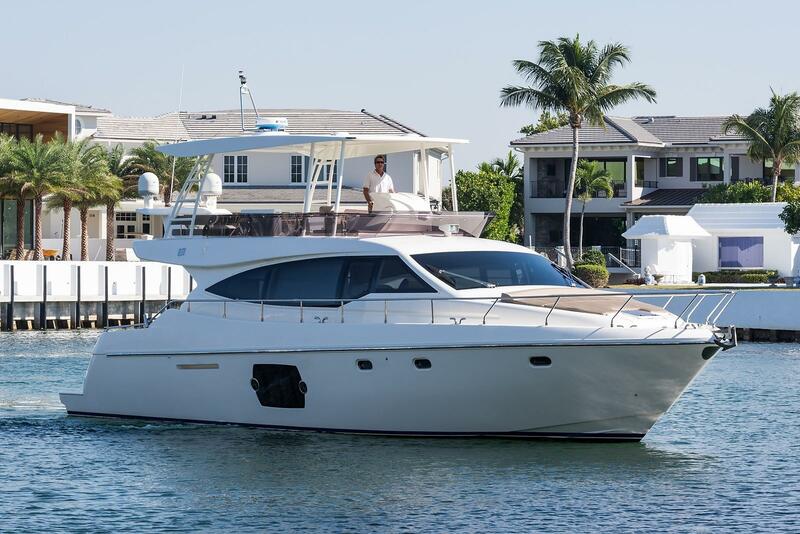 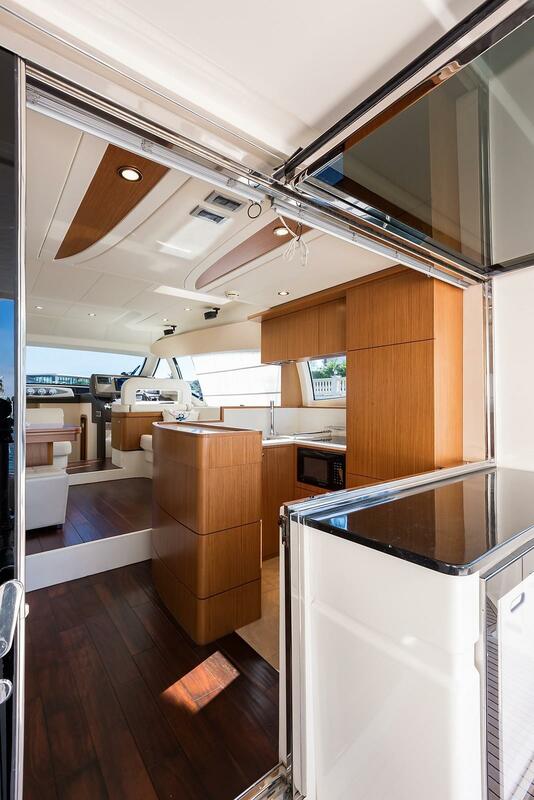 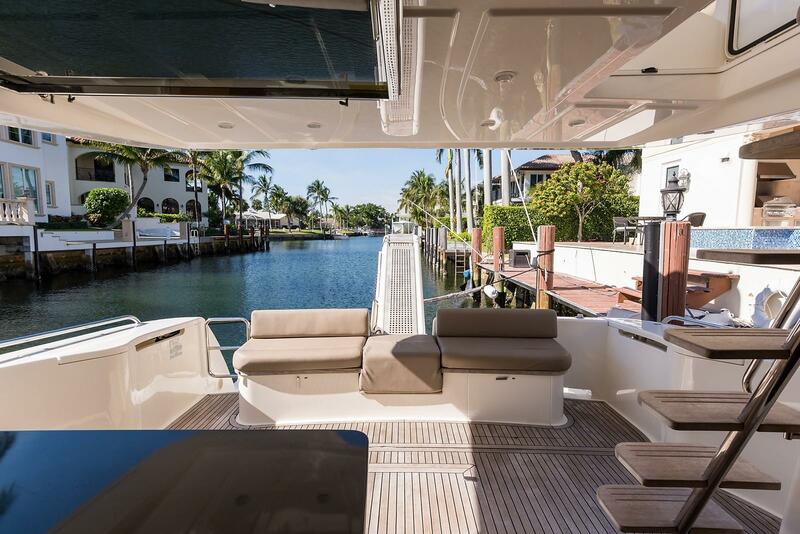 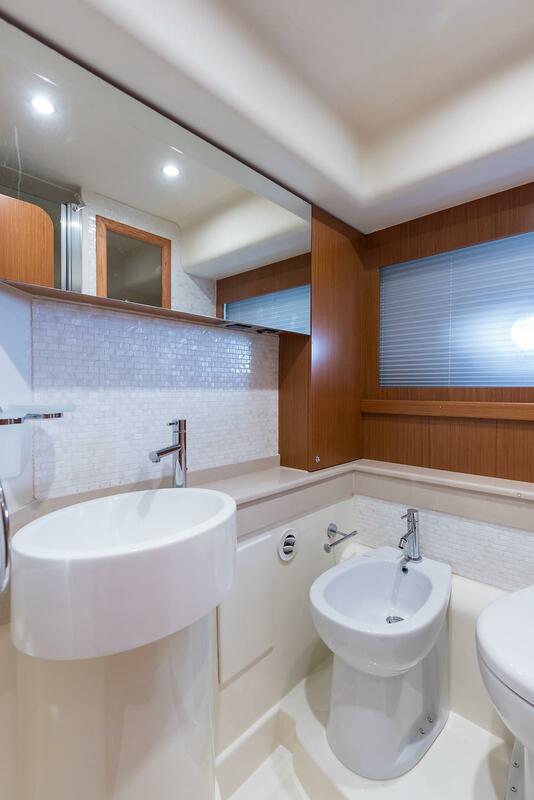 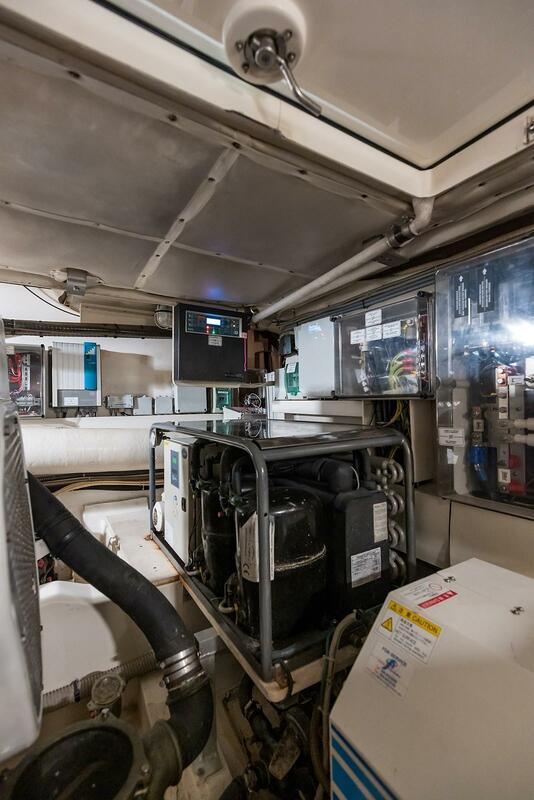 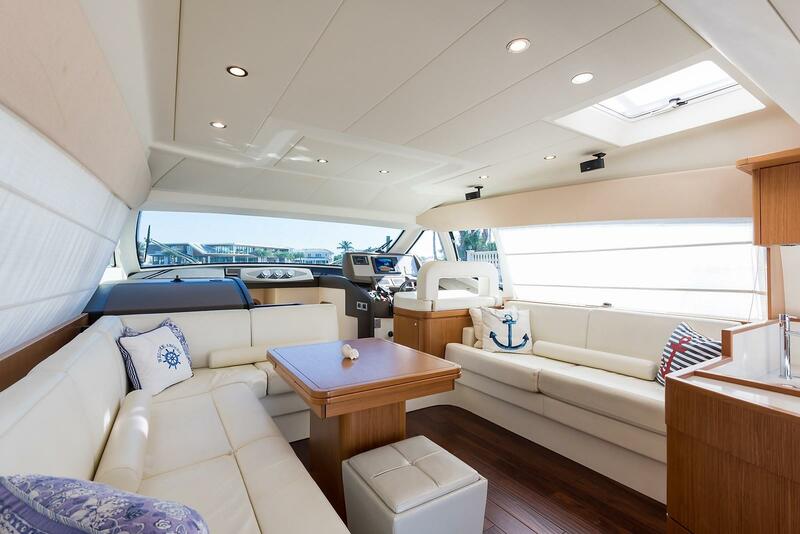 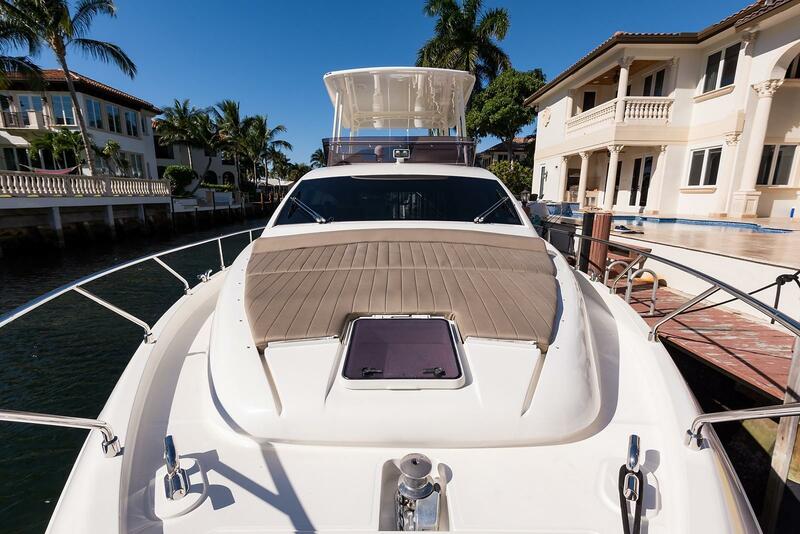 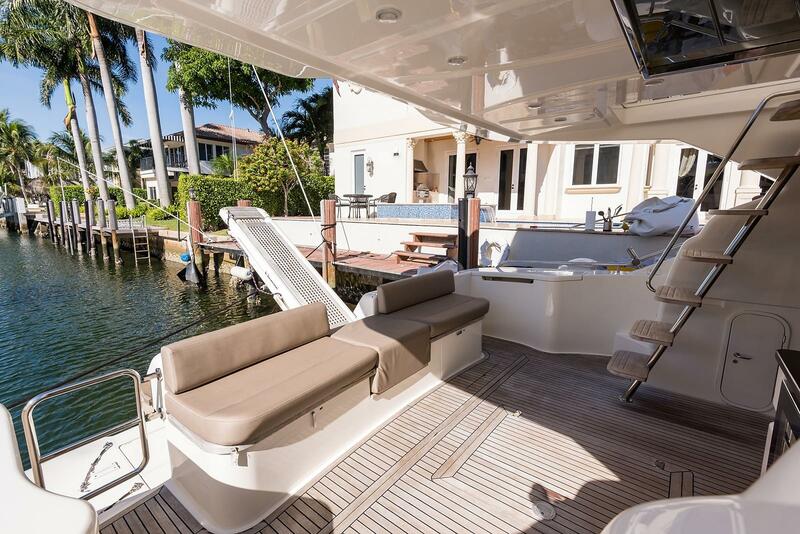 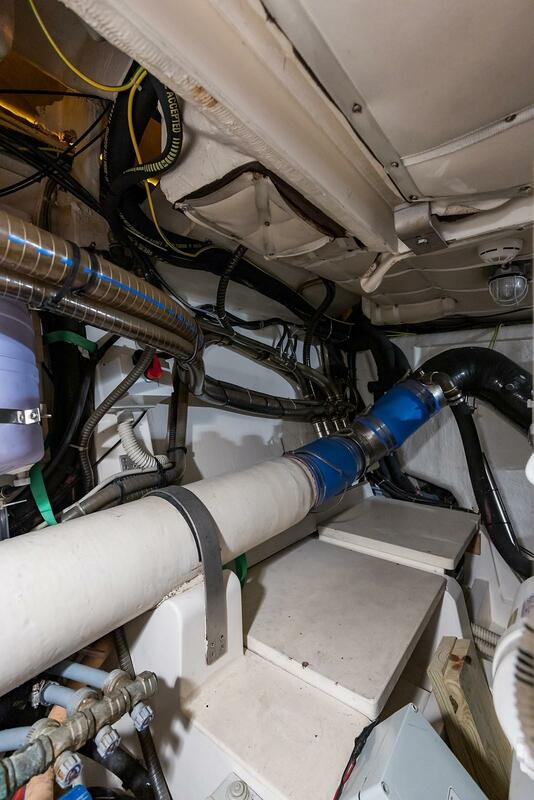 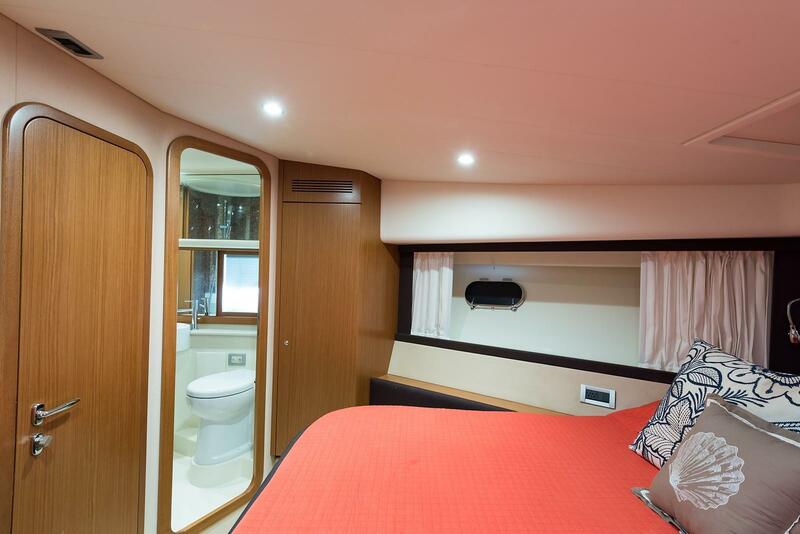 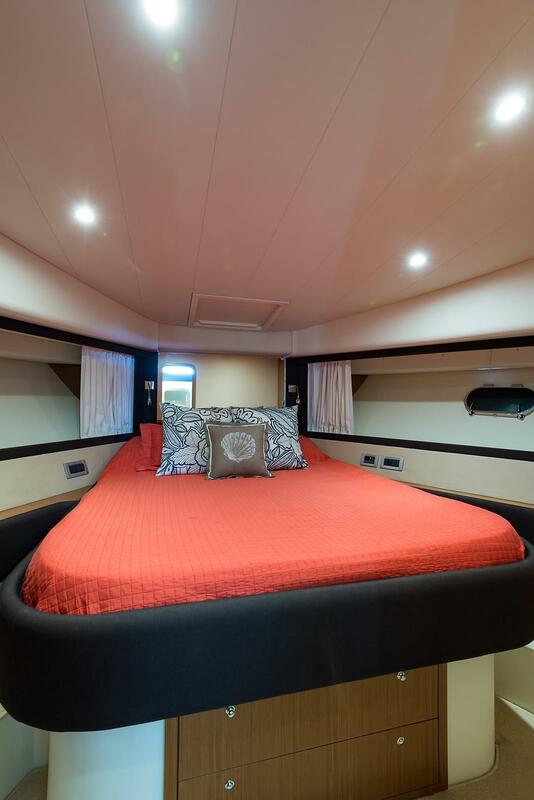 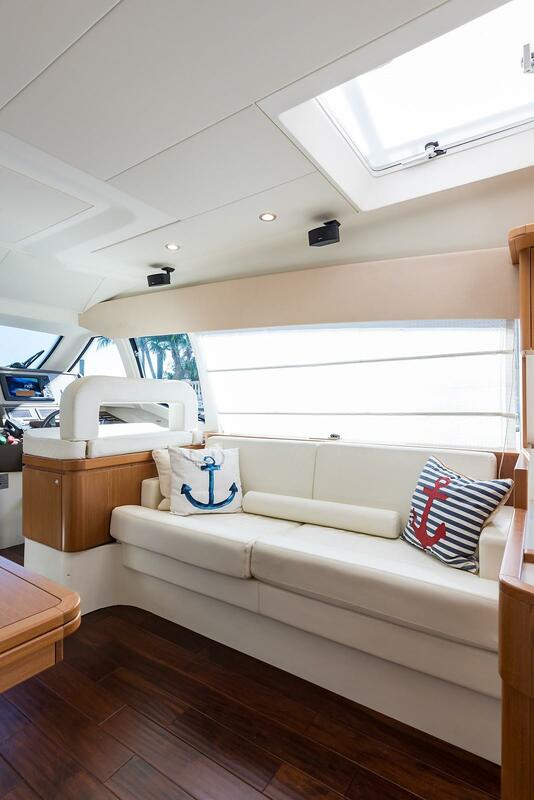 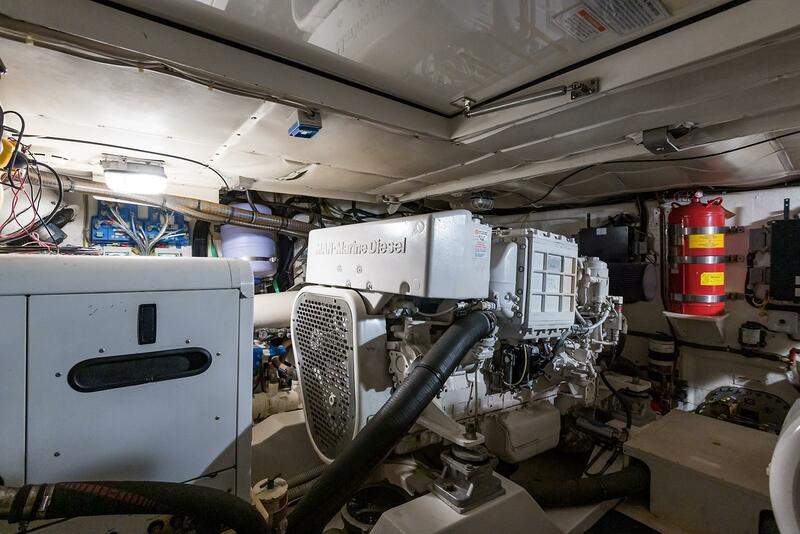 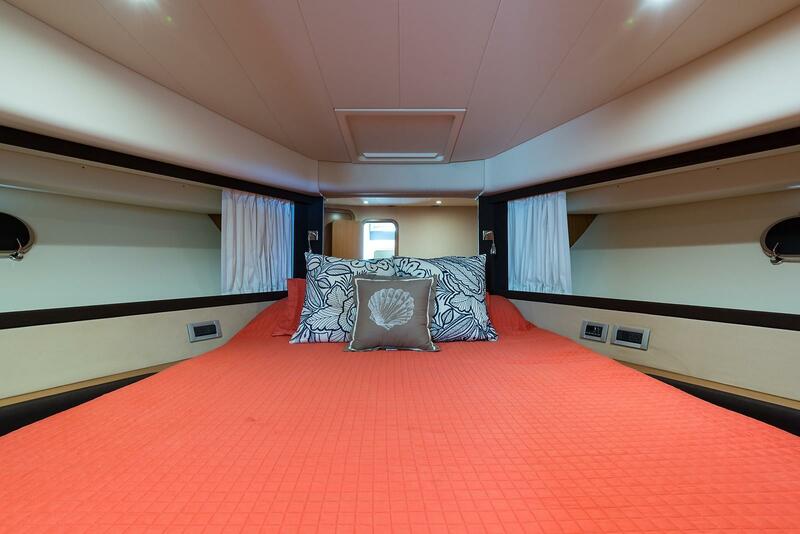 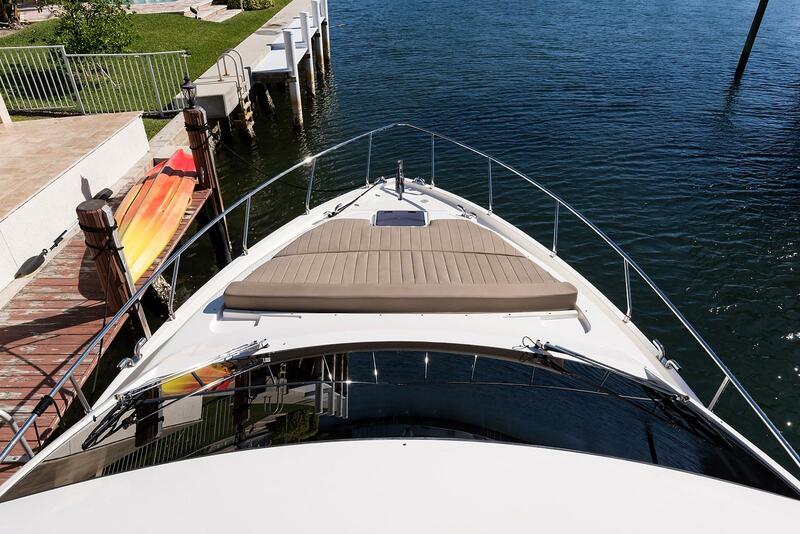 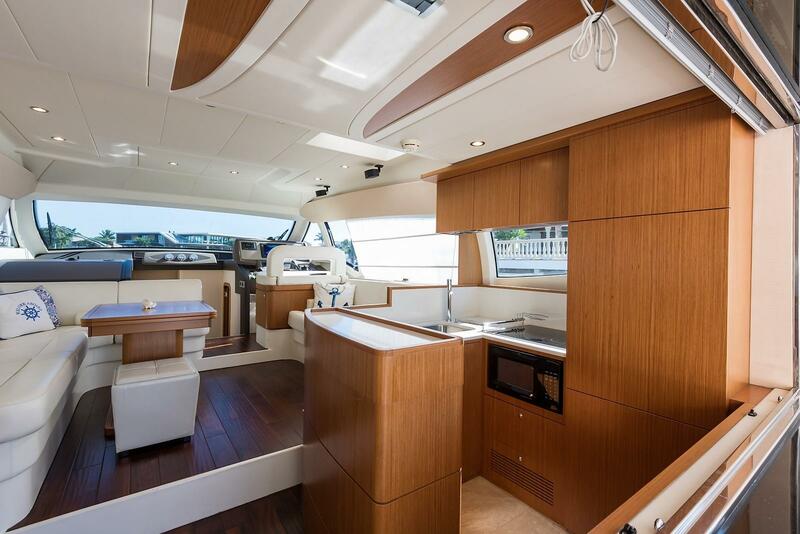 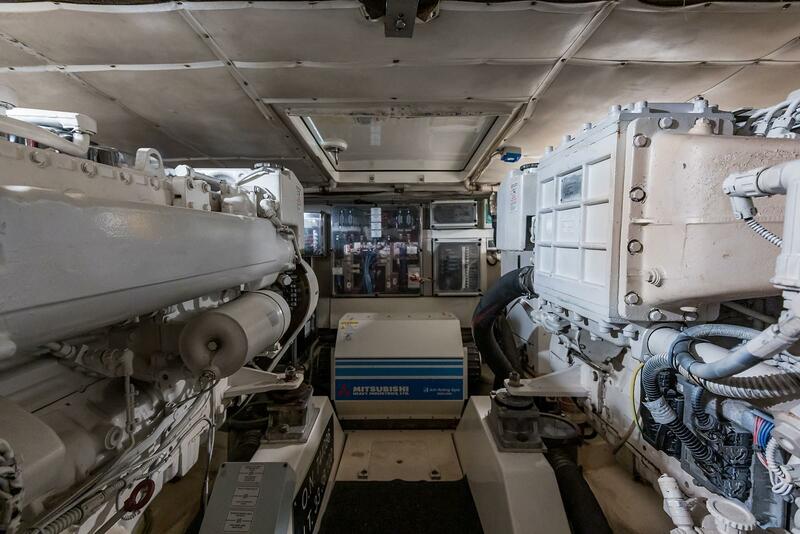 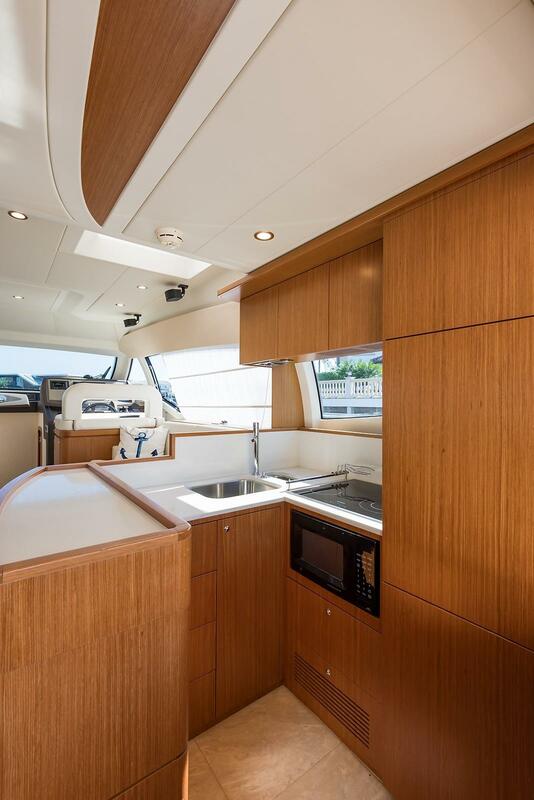 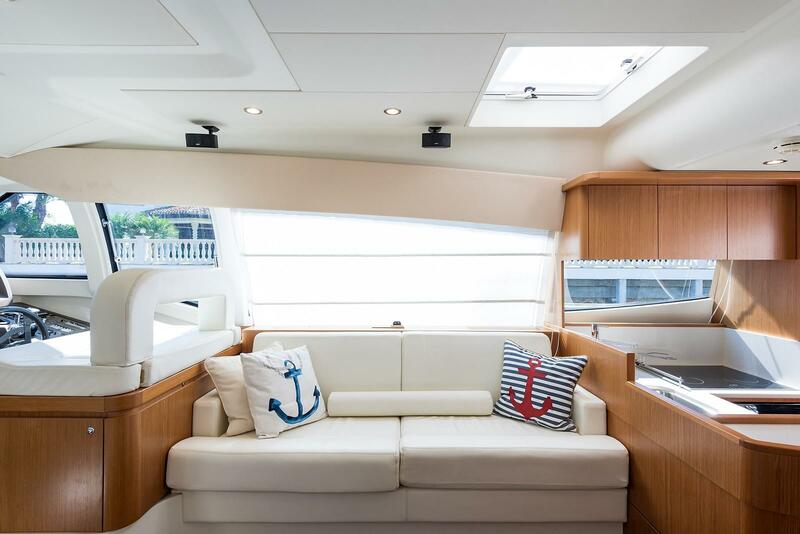 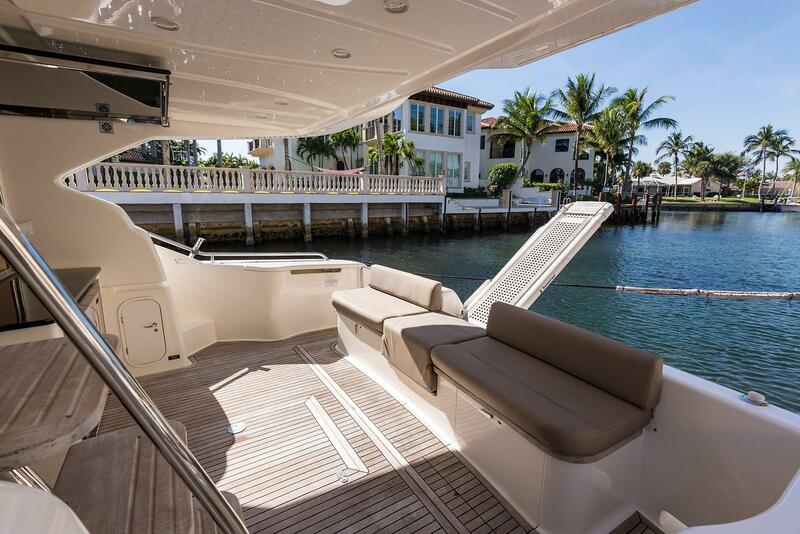 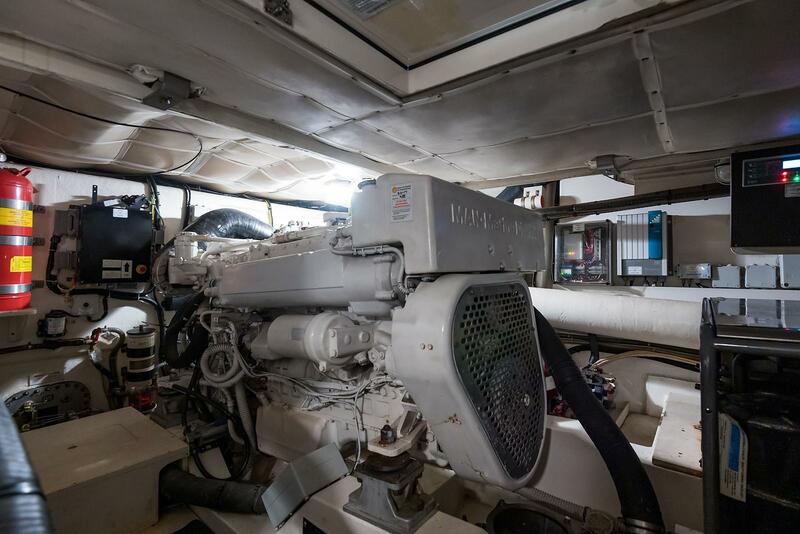 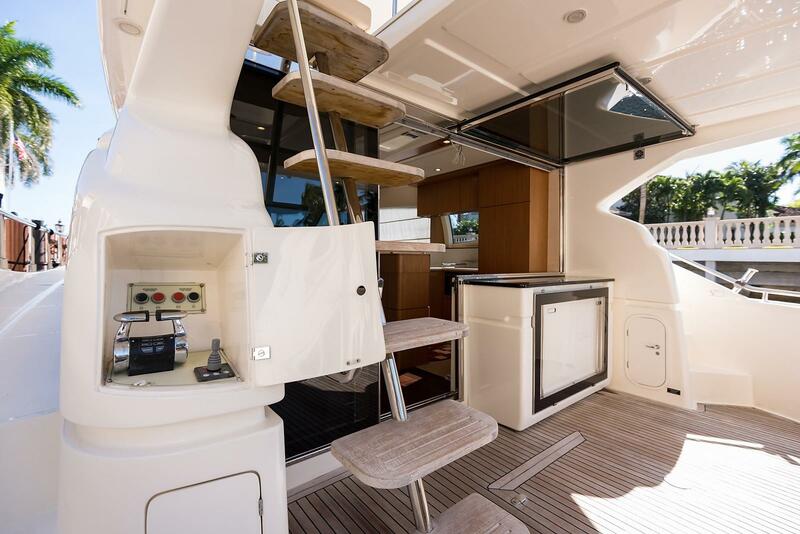 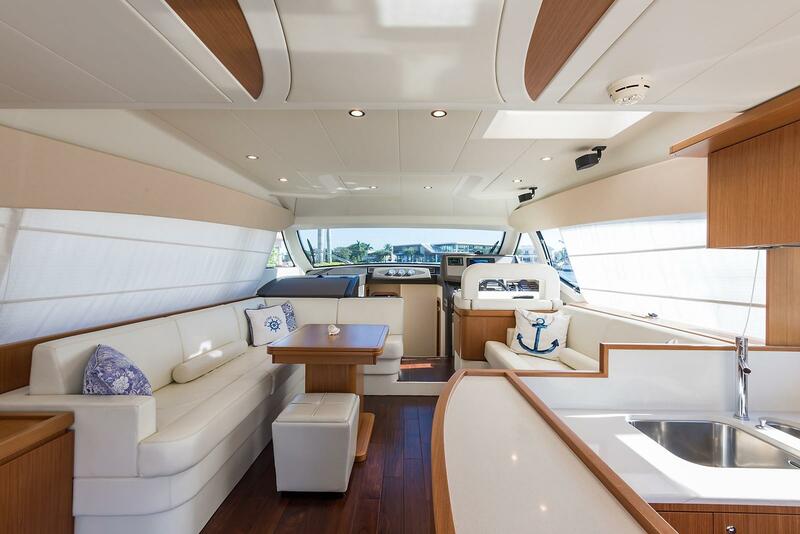 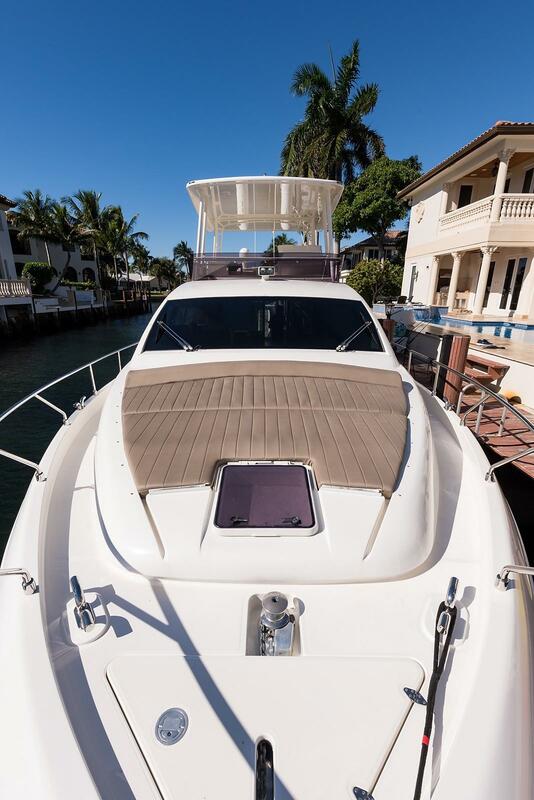 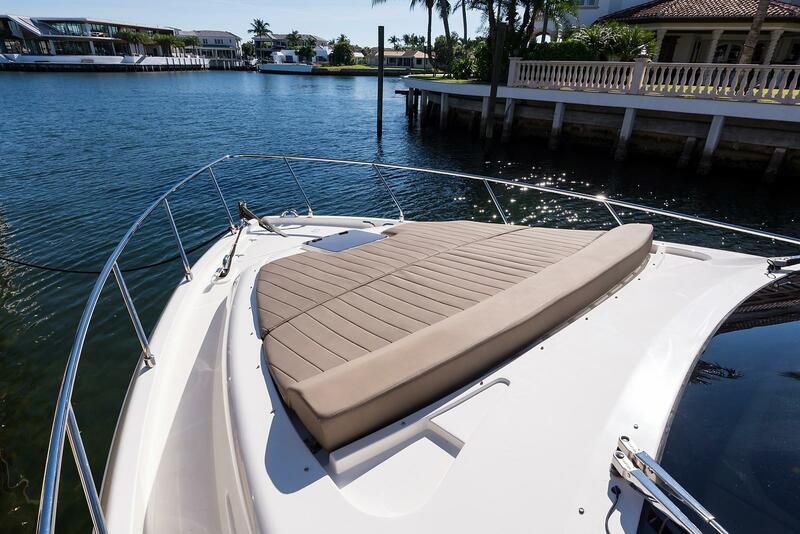 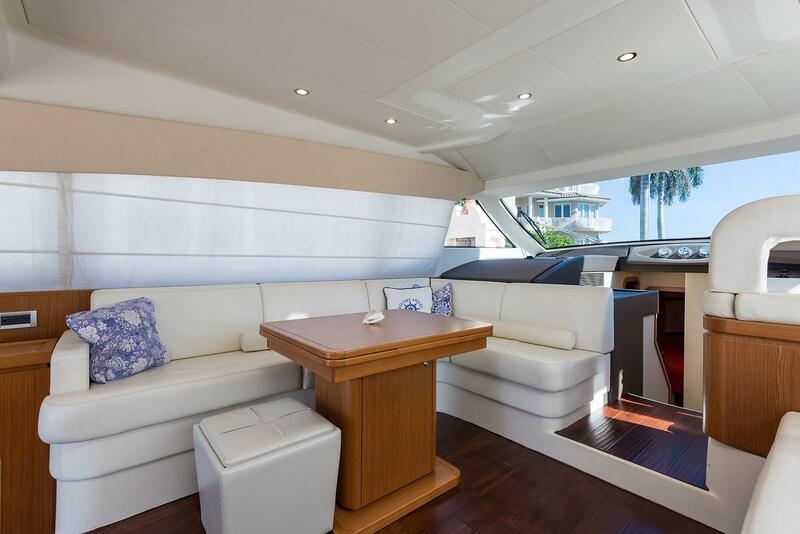 There are many upgrades throughout this FERRETTI 51’, including a beautiful salon and galley wood flooring. 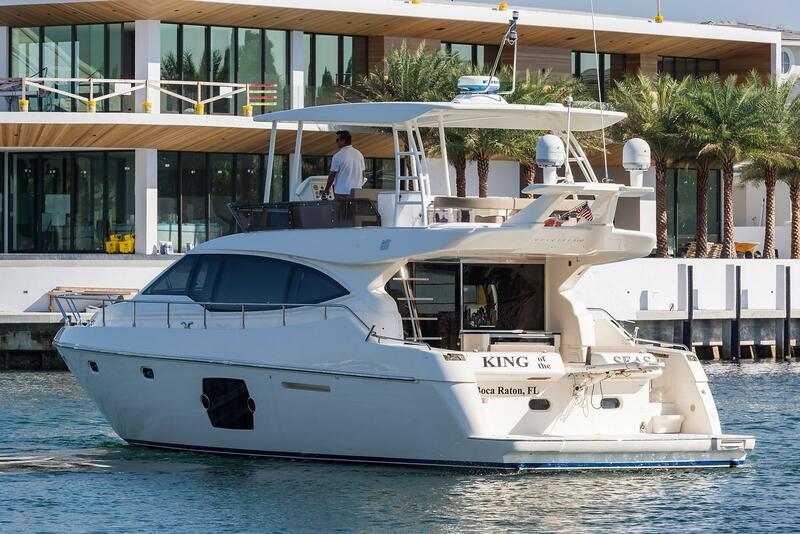 KING OF THE SEAS is aggressively priced and is a must see for anybody looking for their next MOTOR YACHT in the 50+ size range. 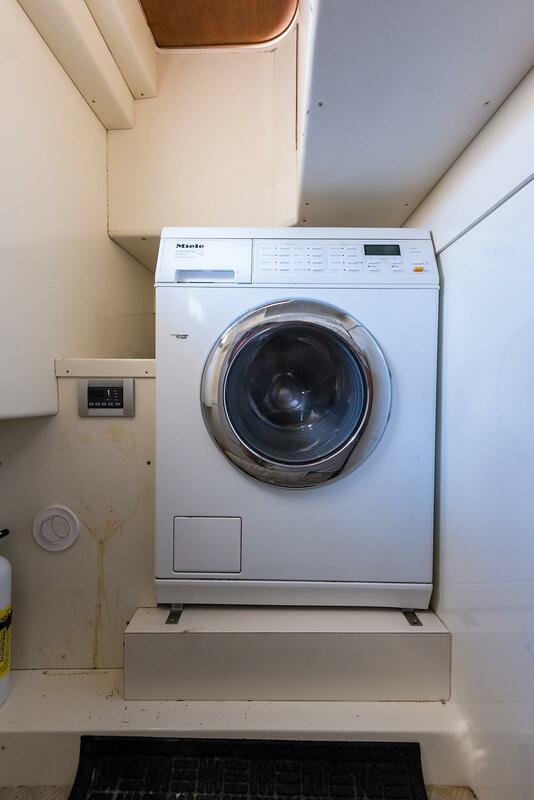 Documentation of maintenance work can be provided upon request. 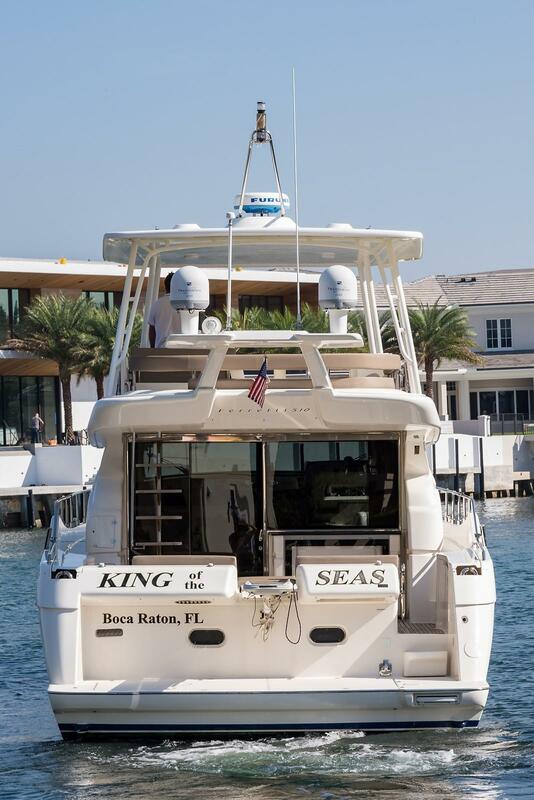 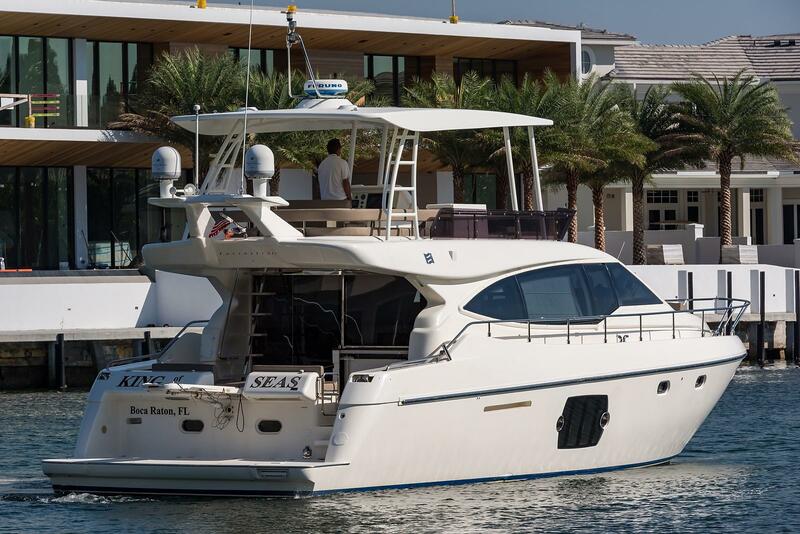 Contact us today to schedule a showing of the 2010 FERRETTI YACHTS 51’ MOTOR YACHT KING OF THE SEAS. 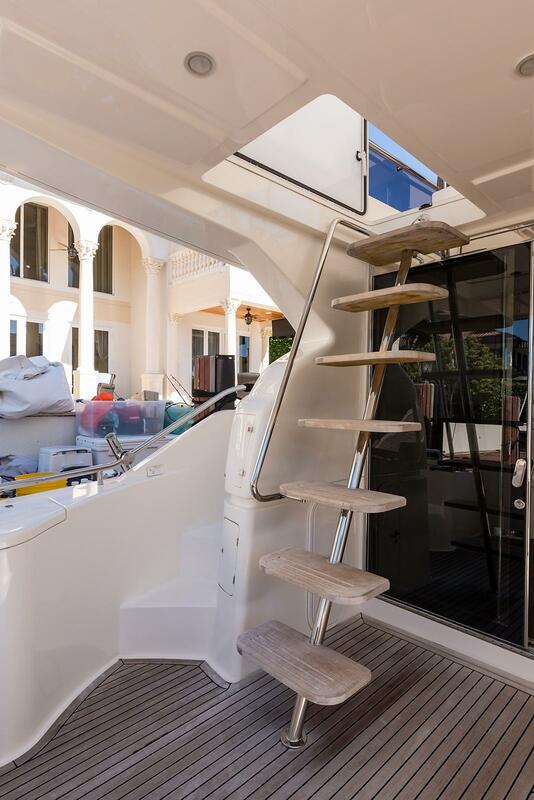 A passerelle allows boarding ease to the aft deck with teak sole and seating to port and starboard. 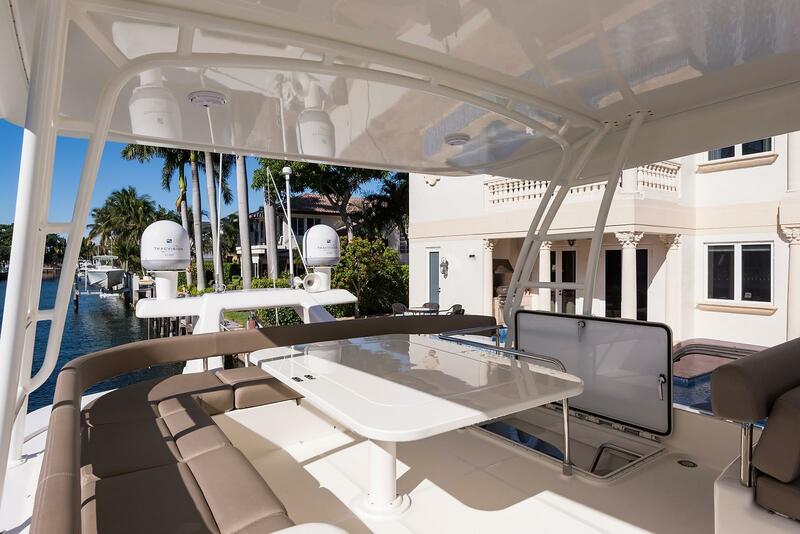 A fiberglass cabinet with custom Corian top houses an icemaker and offers a pop-up glass table. 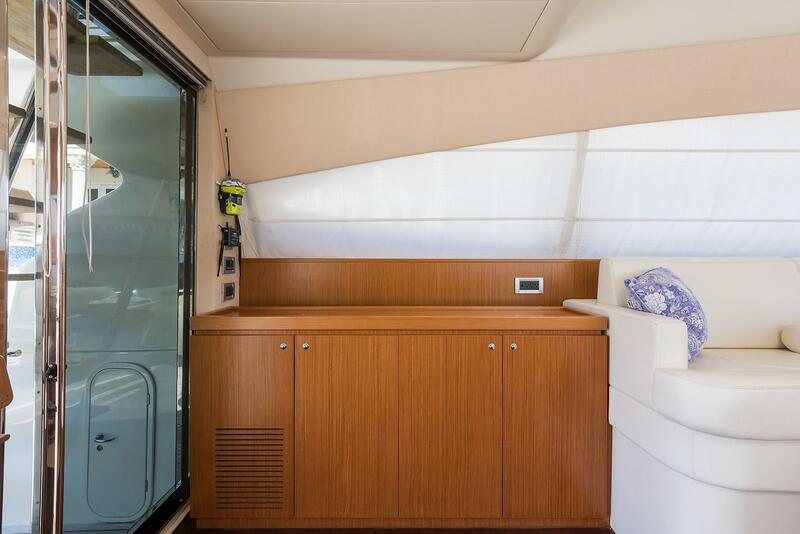 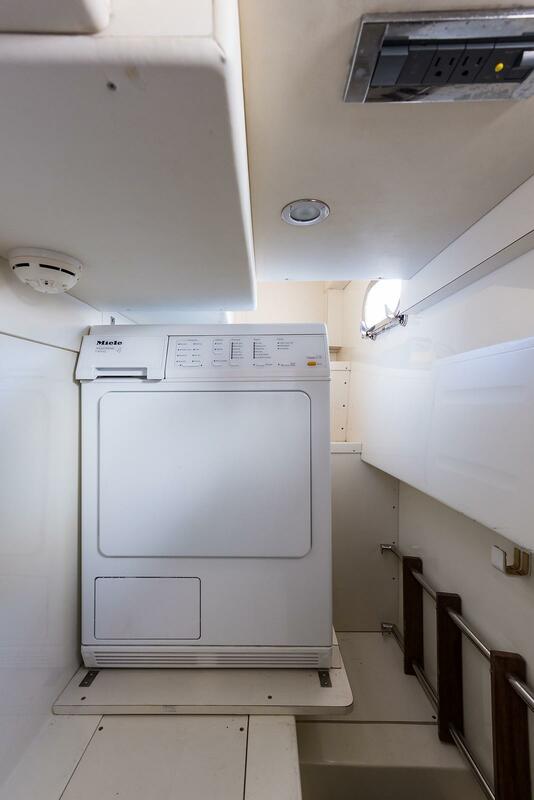 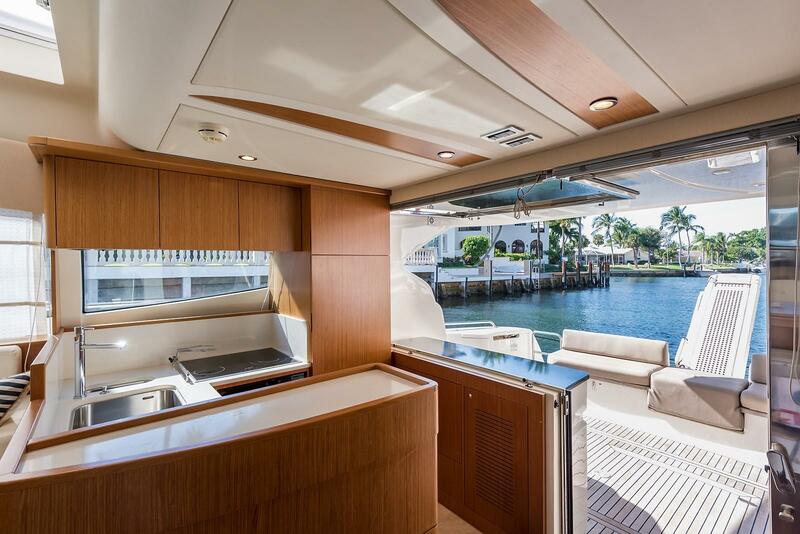 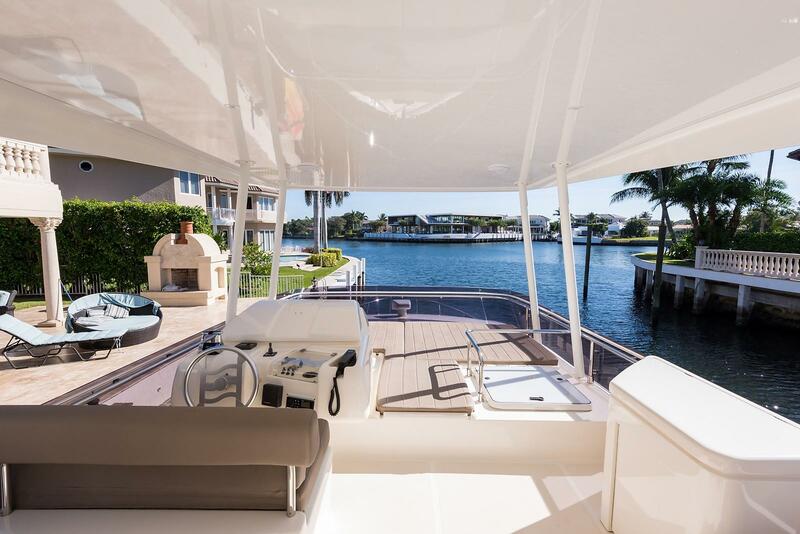 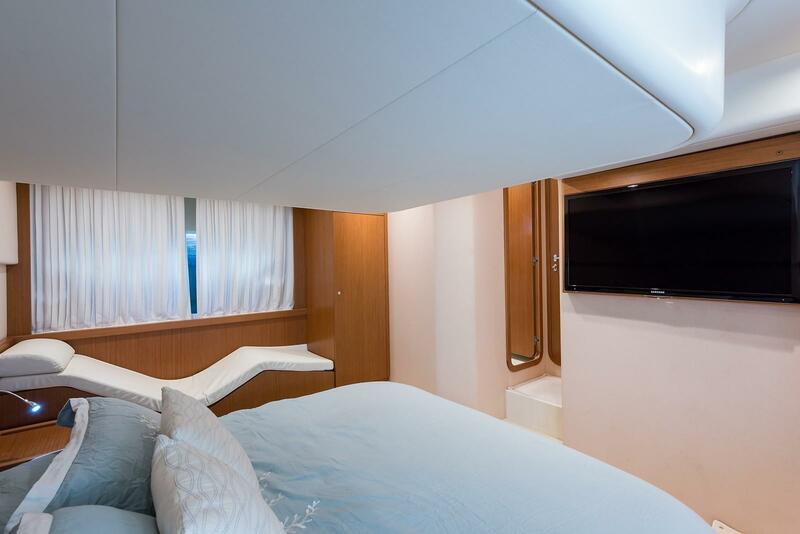 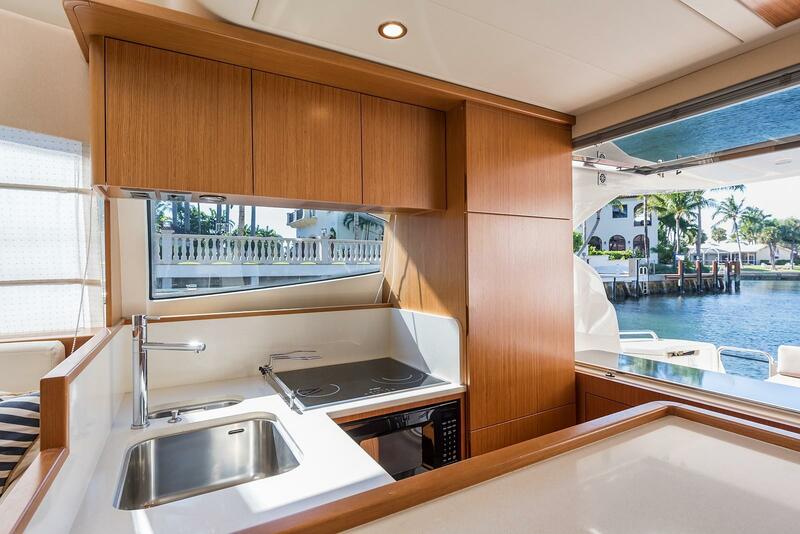 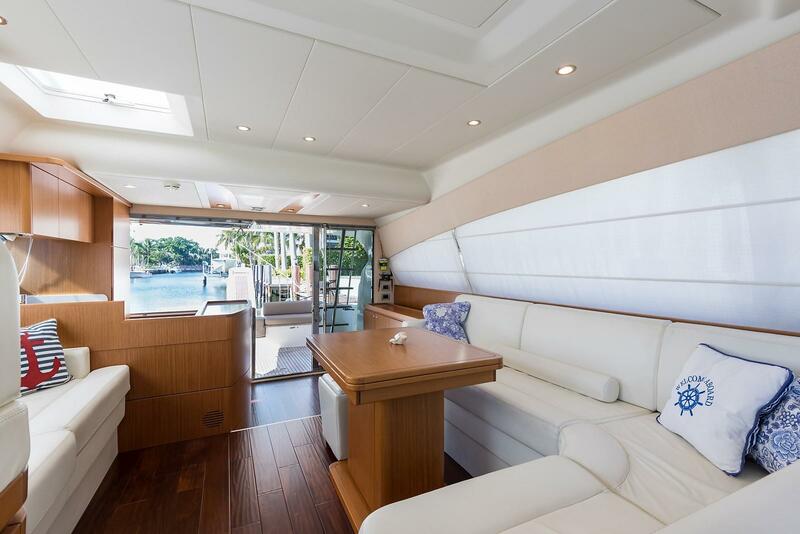 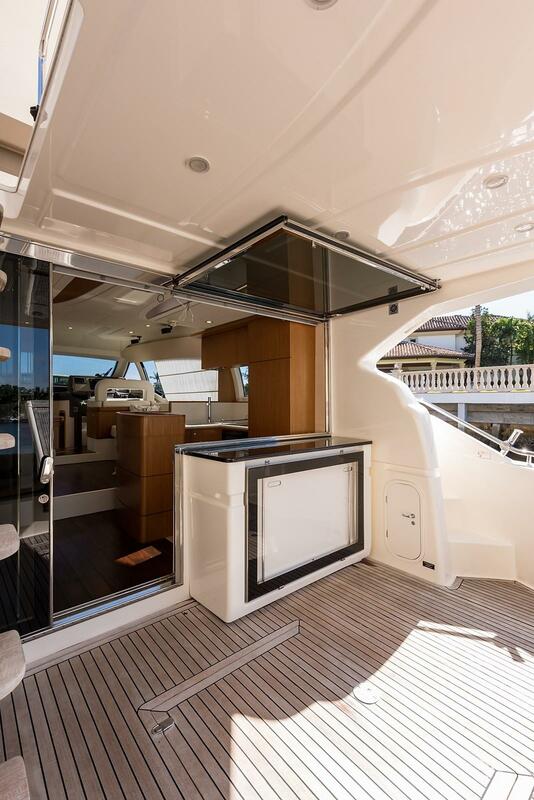 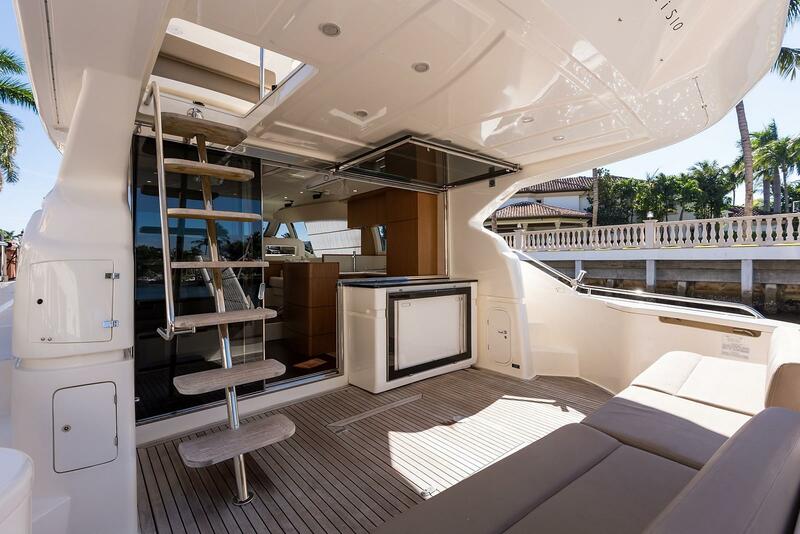 This stainless steel sliding door provides access to the interior living area and a portside window opens not only to allow service between the galley and aft deck but also to create an indoor/ outdoor living area when the sliding door is also open. 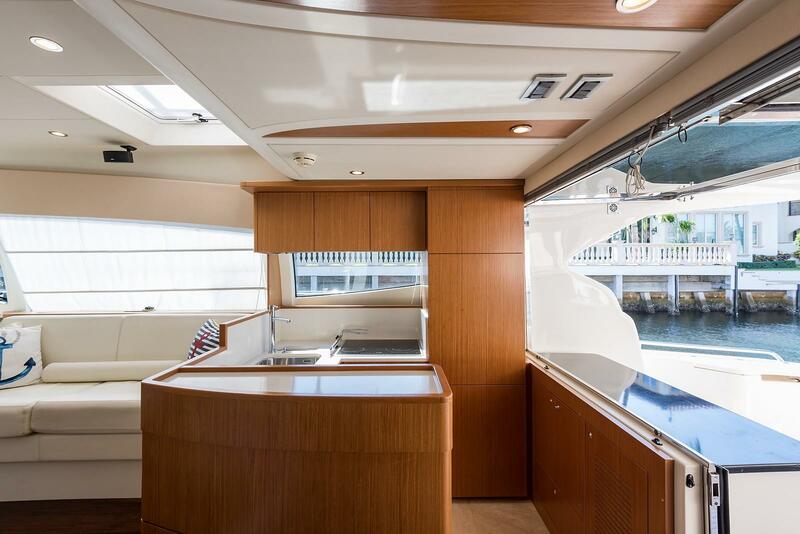 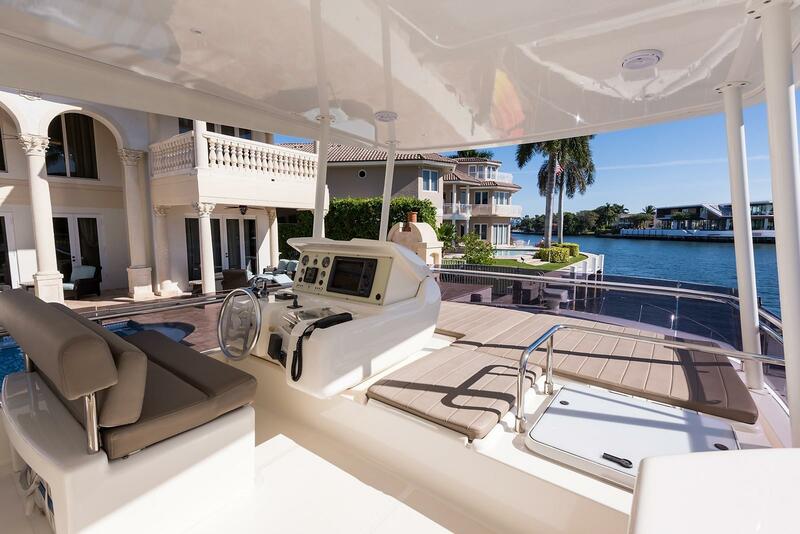 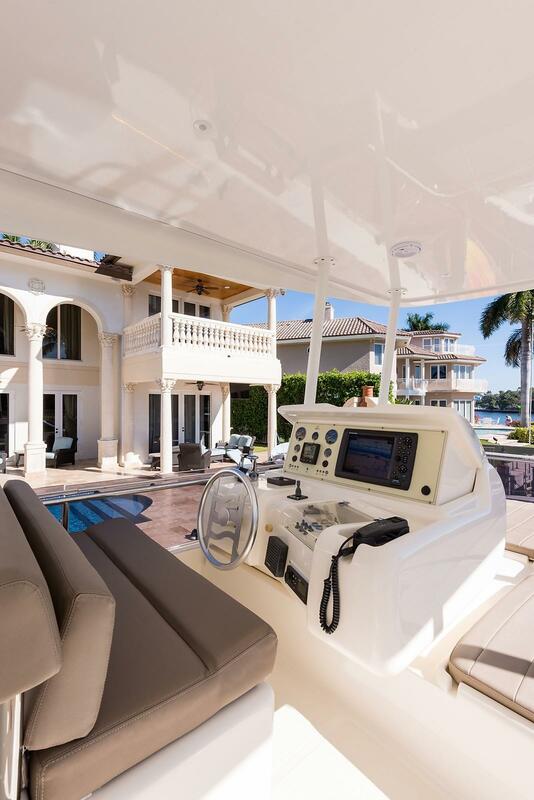 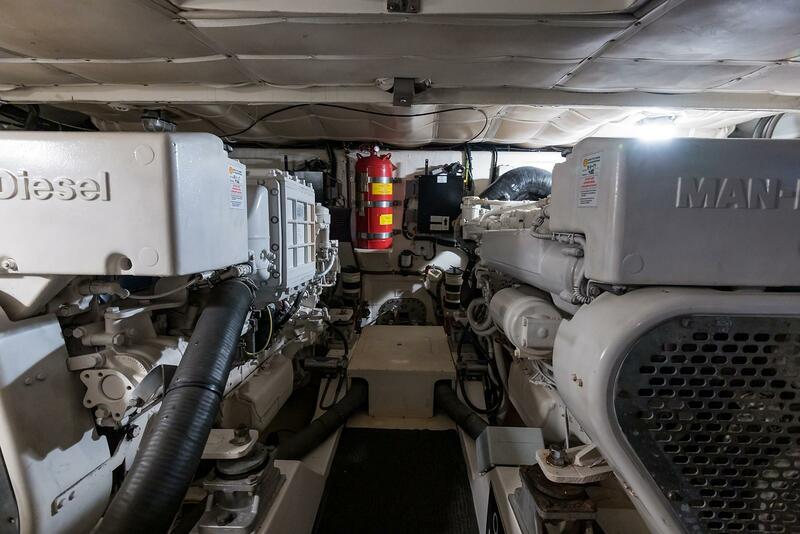 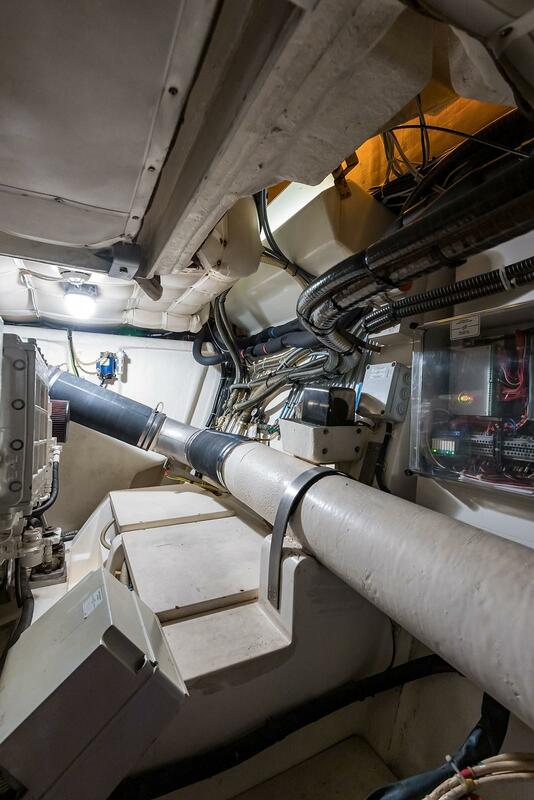 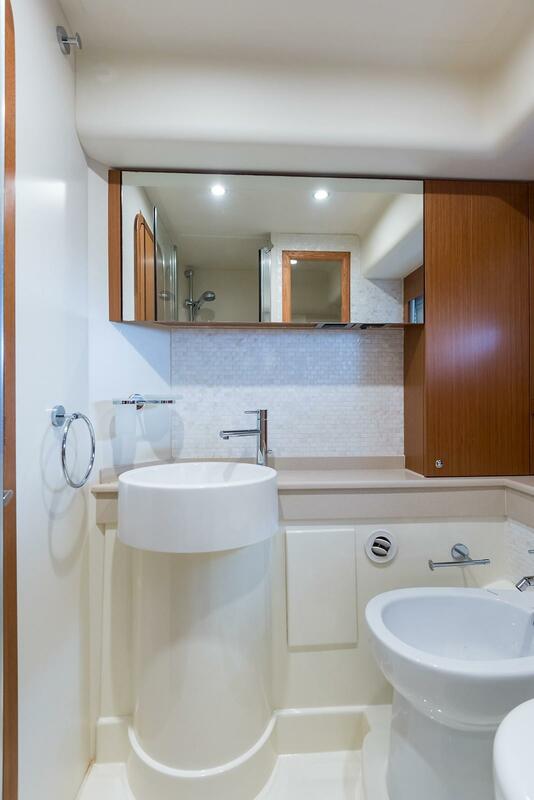 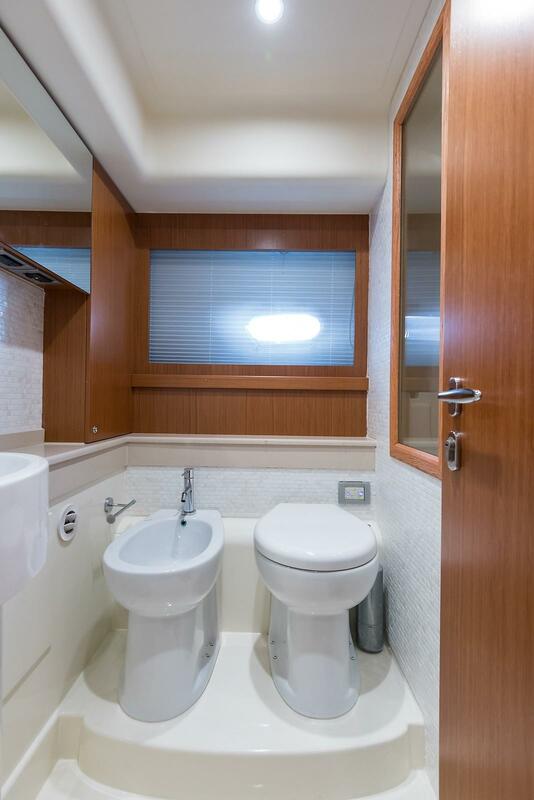 Entering the interior, the galley is immediately to port and is open to the aft deck (via the bulk head window)and to the salon offering great serving convenience. 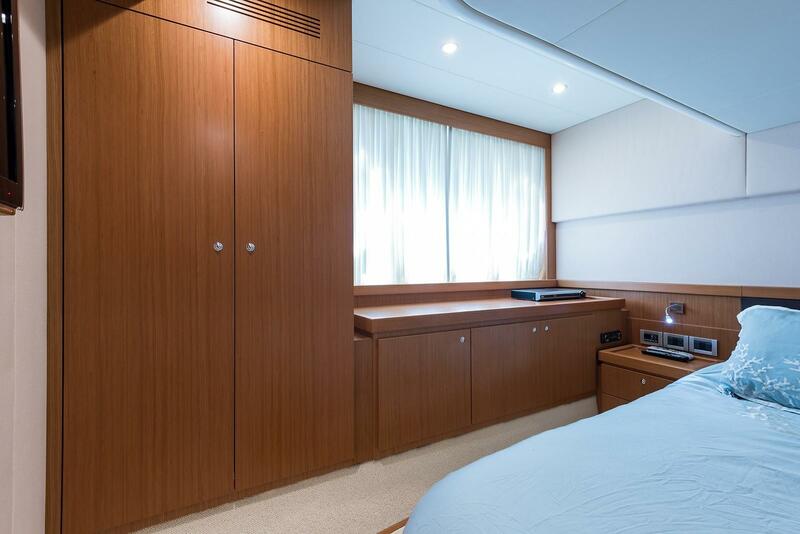 Adjacent to the galley is a cabinet with storage. 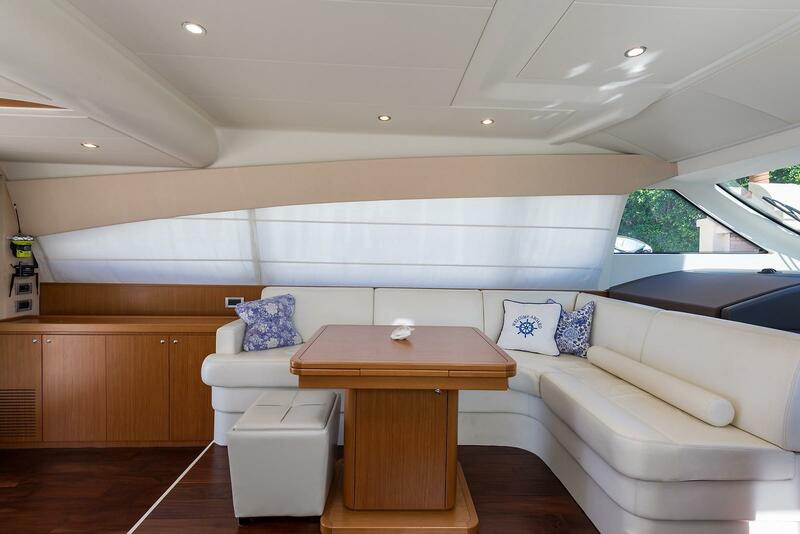 Up one step is the salon, furnished with L-shaped sofa to starboard and single sofa to port. 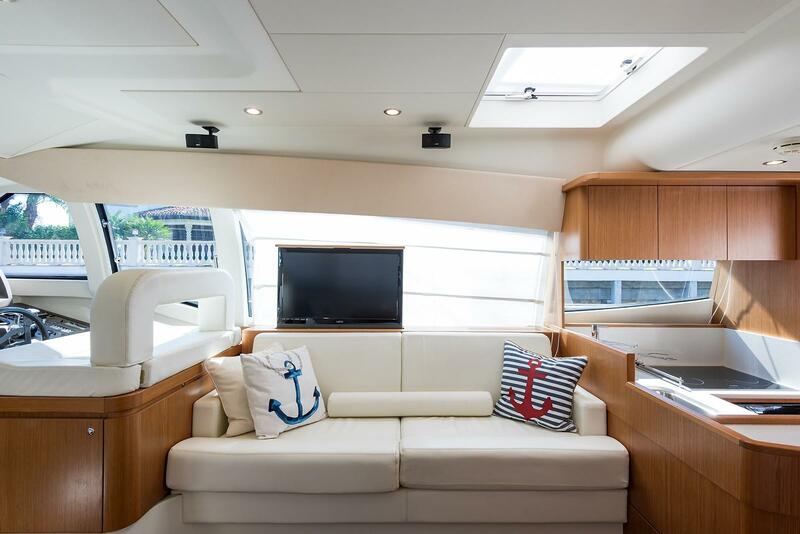 Behind the port side sofa is a retractable TV. 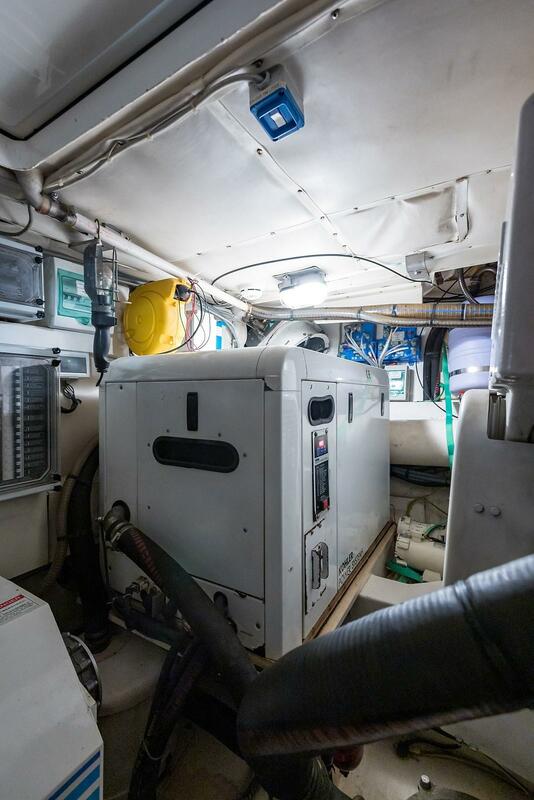 The lower helm station is on the forward starboard side with excellent visibility through the large one-piece glass front window. 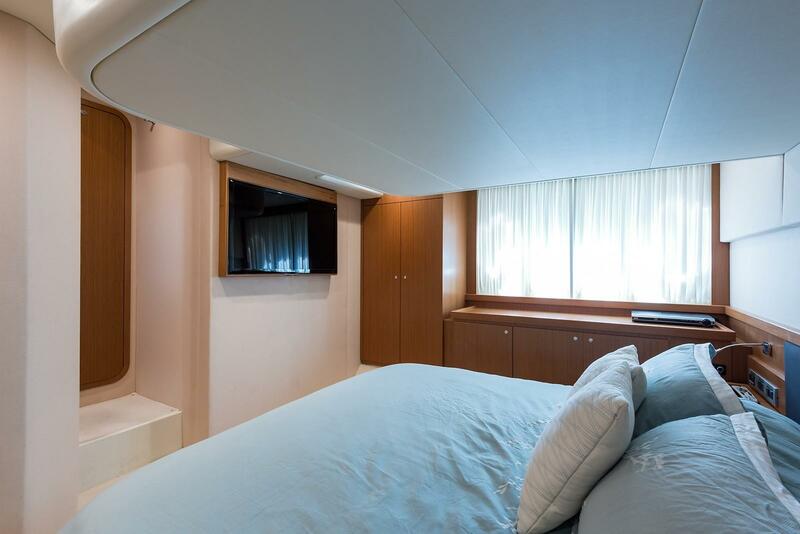 Going below, there are three staterooms. 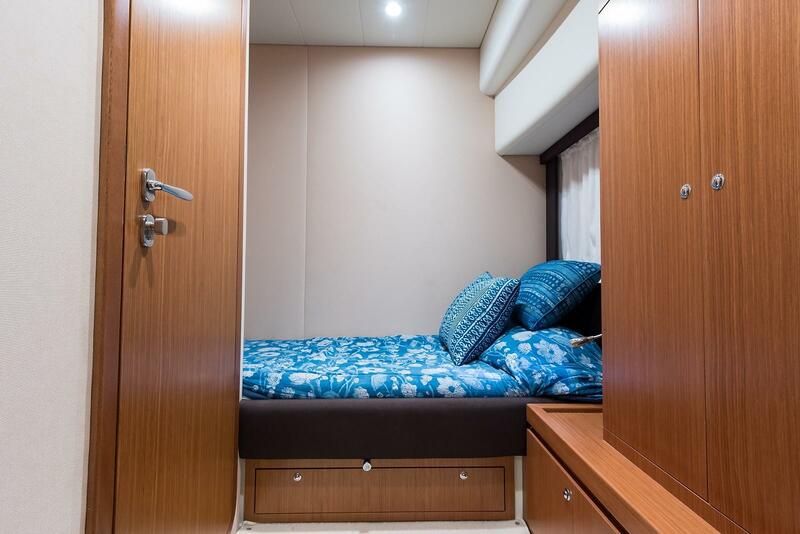 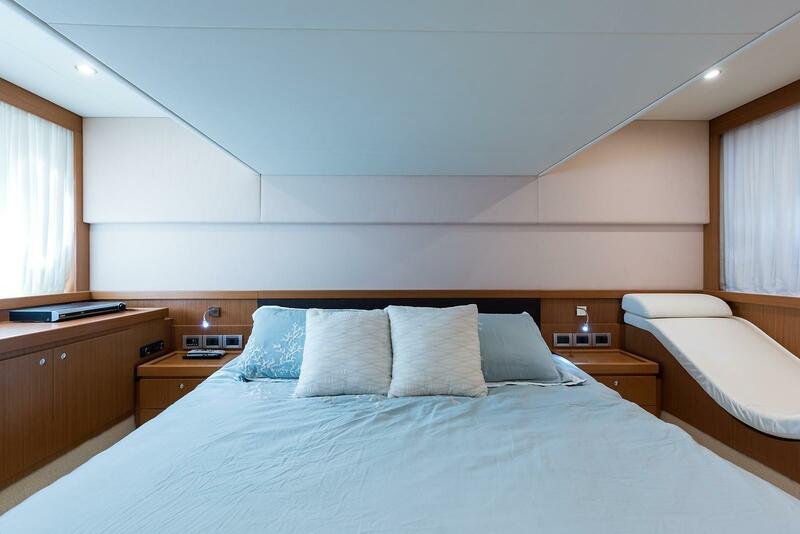 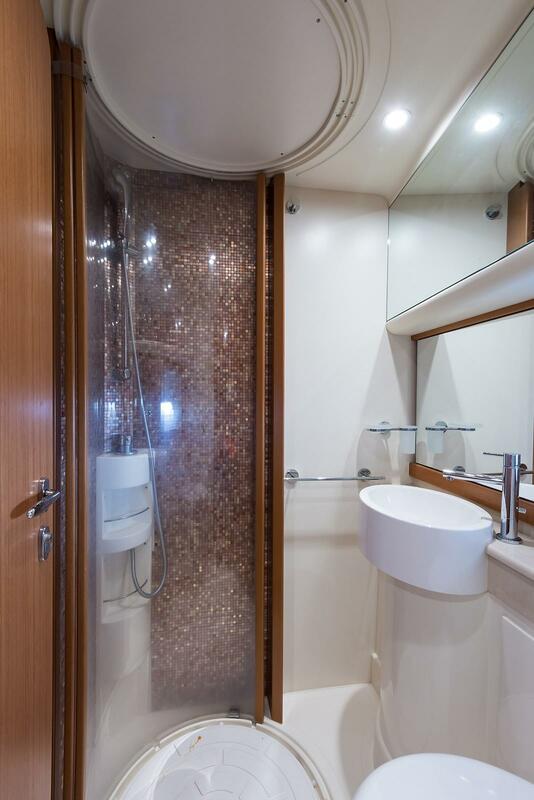 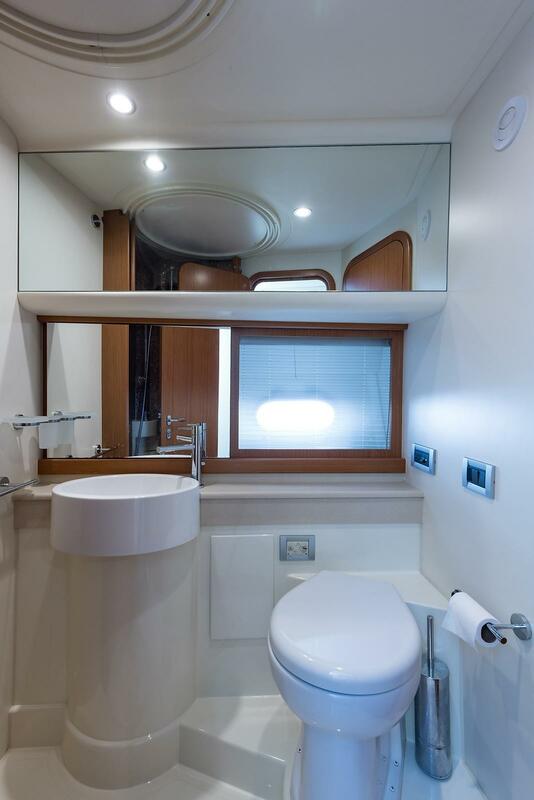 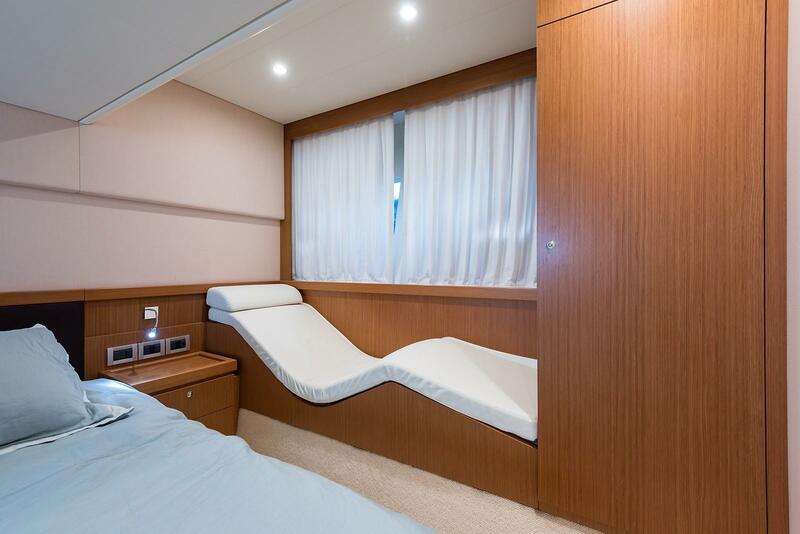 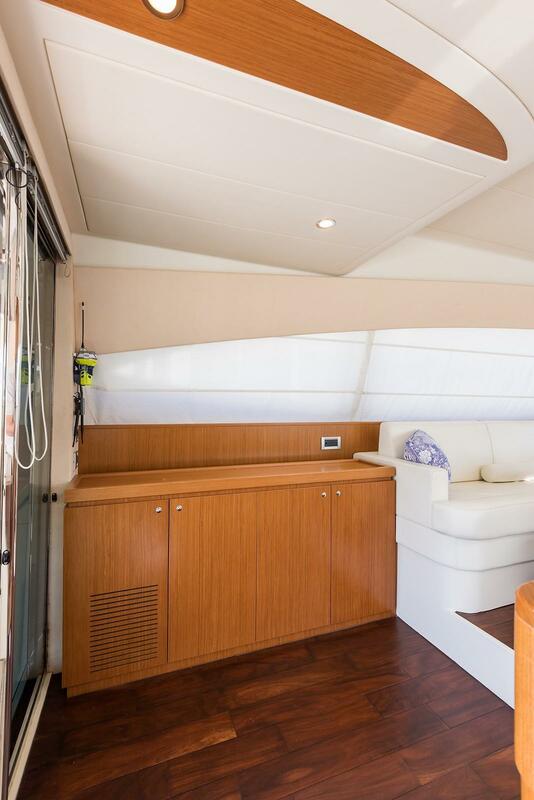 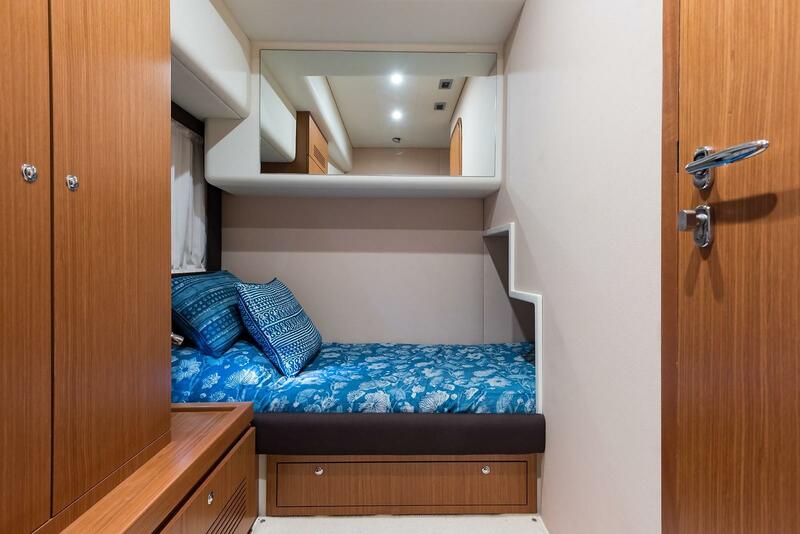 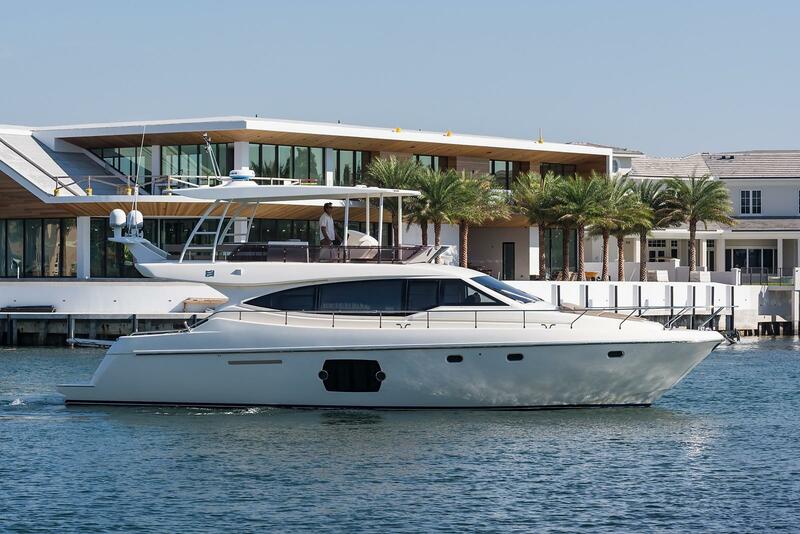 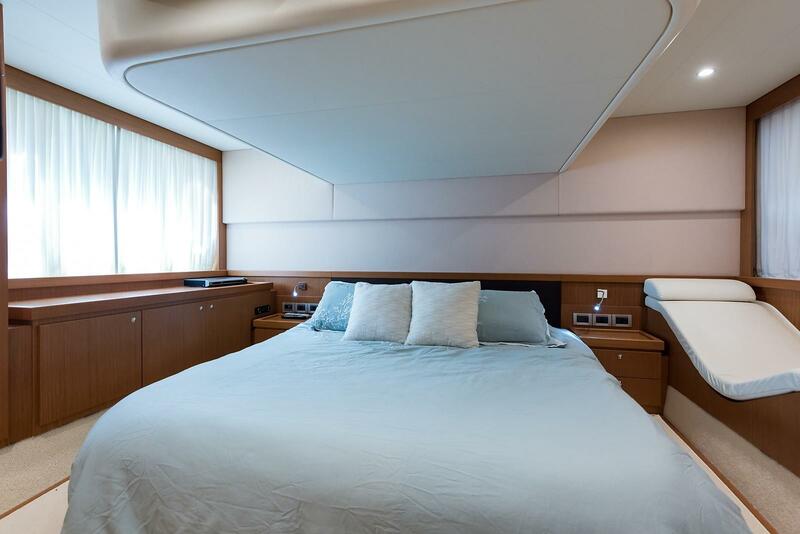 The aft, full-beam Master is located in the best riding area of the yacht and offers two large windows, hanging lockers and a private head and shower. 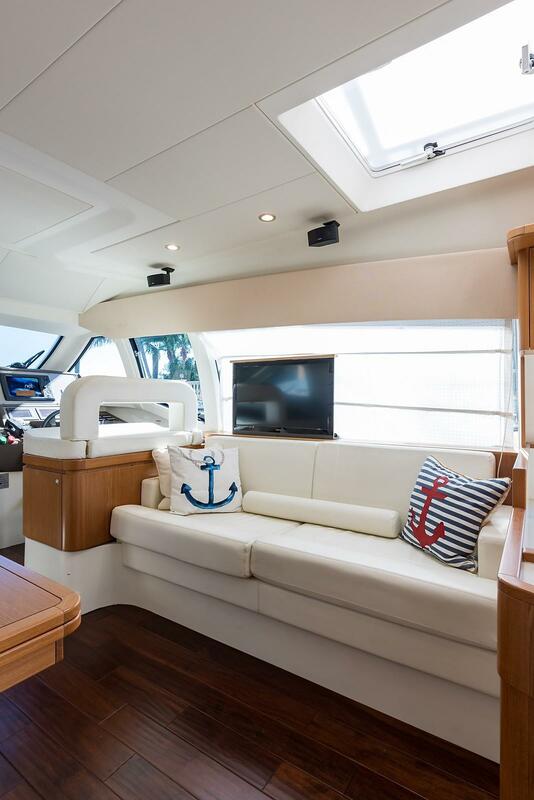 There is also a large 50” flat screen TV on the bulkhead and surround-soundstereo. 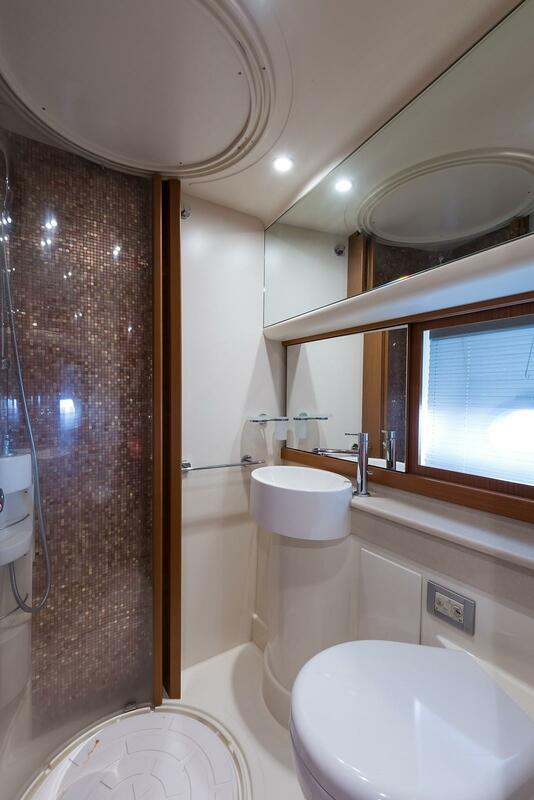 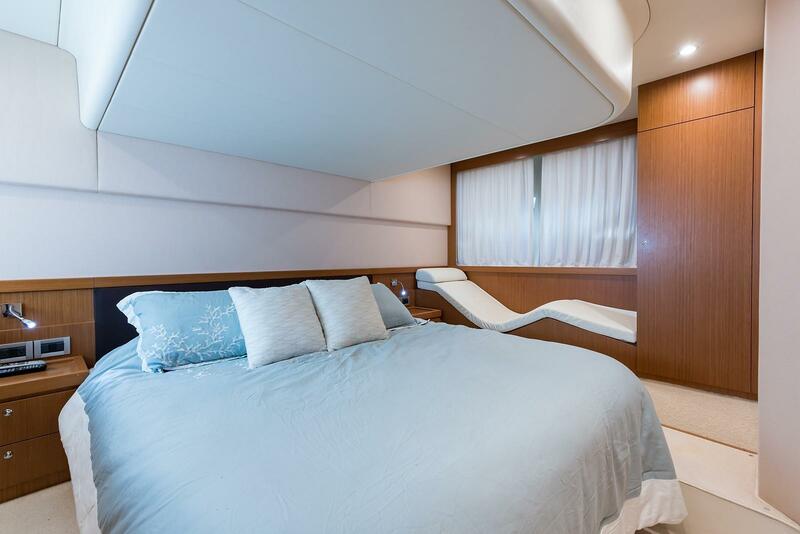 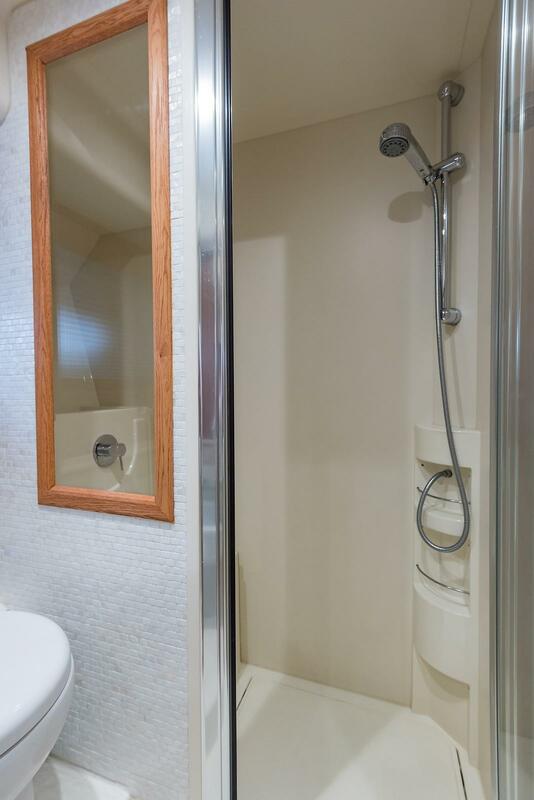 The VIP Queen berth in the bow and the twin-berthed guest stateroom on the starboard side share a head and shower. 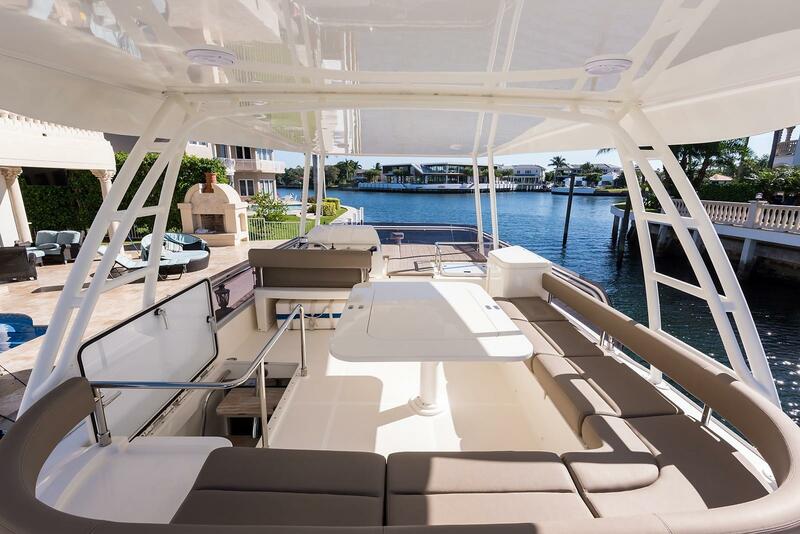 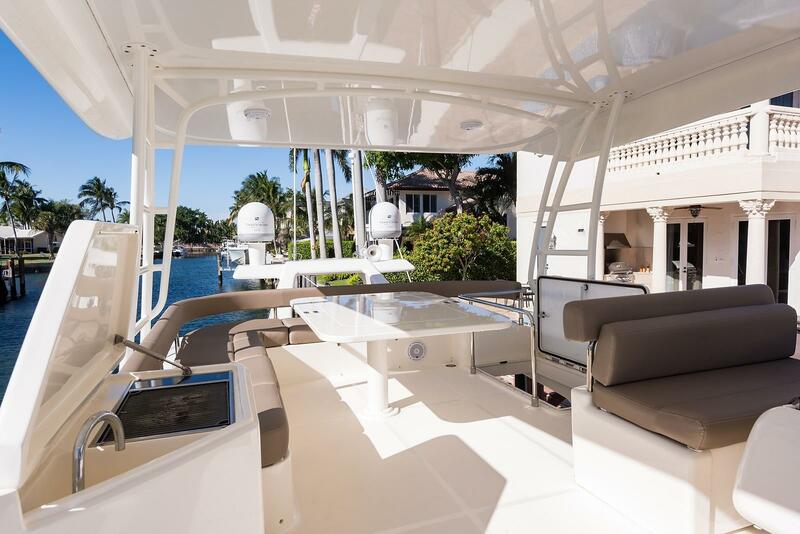 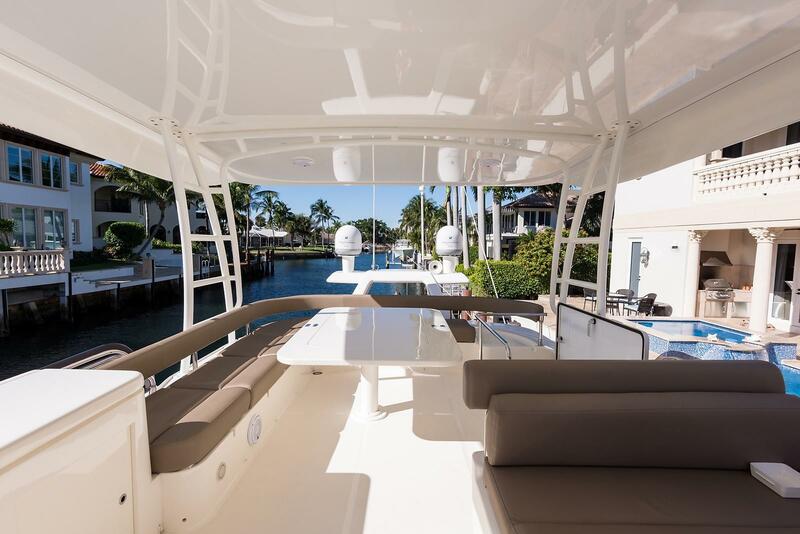 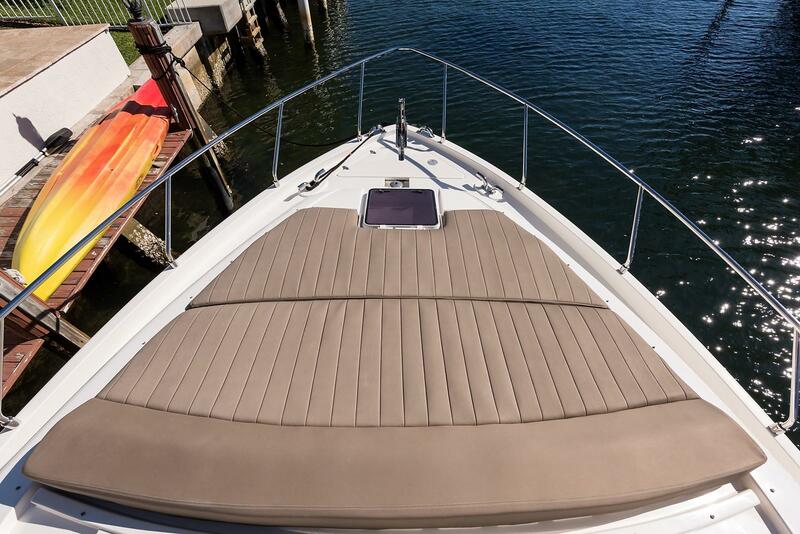 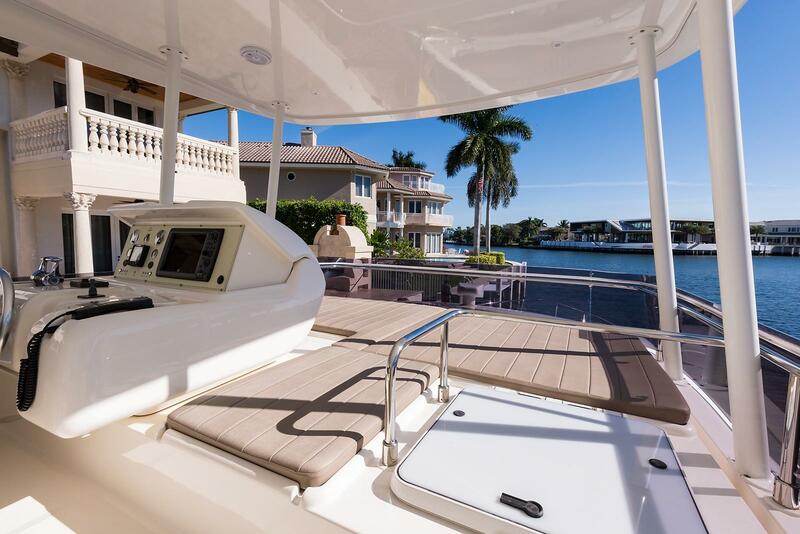 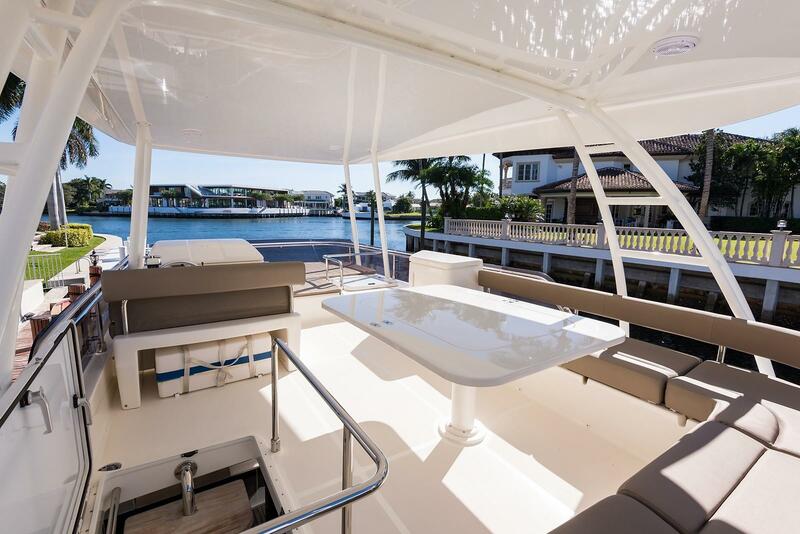 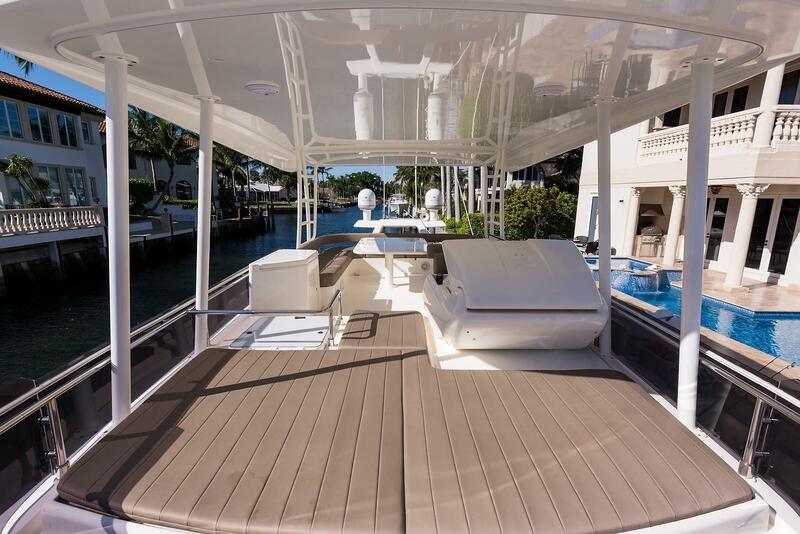 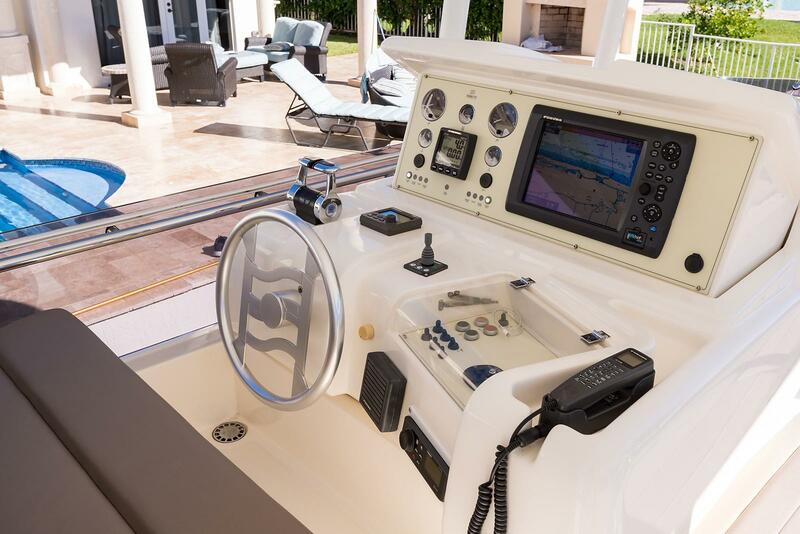 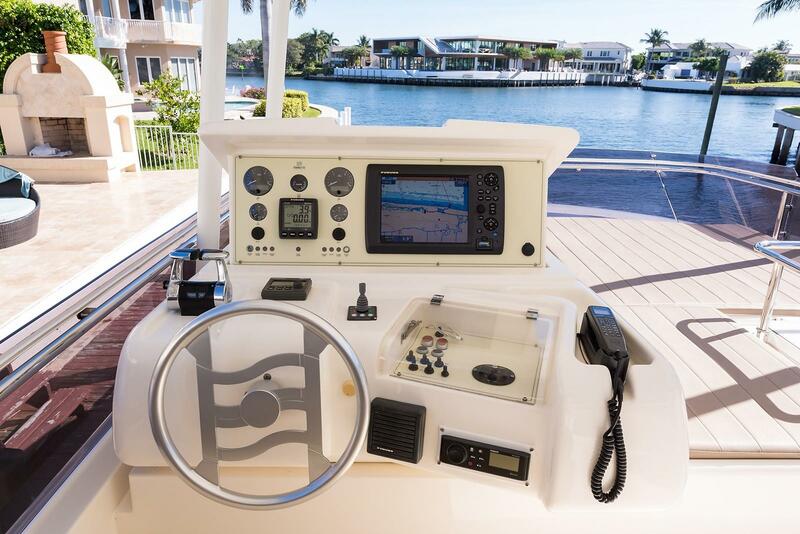 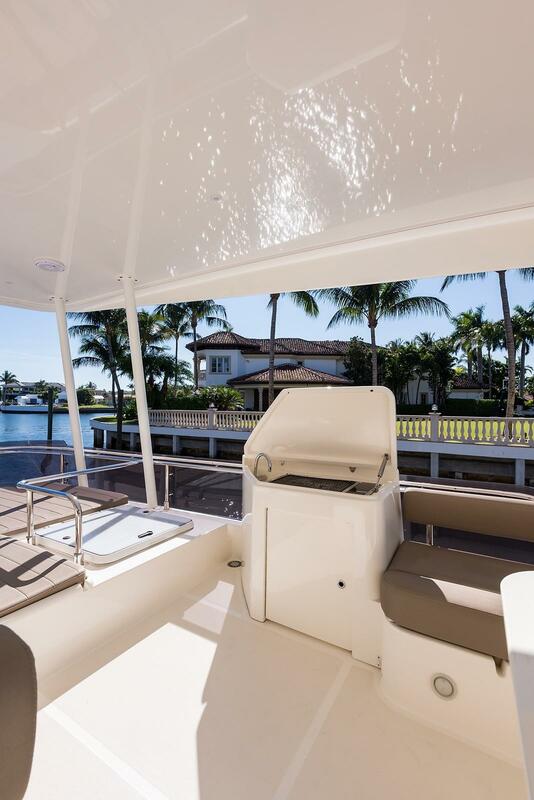 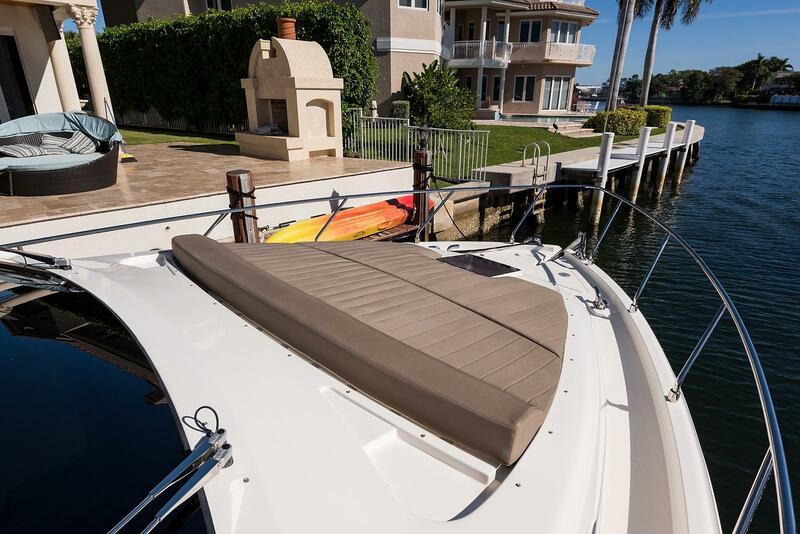 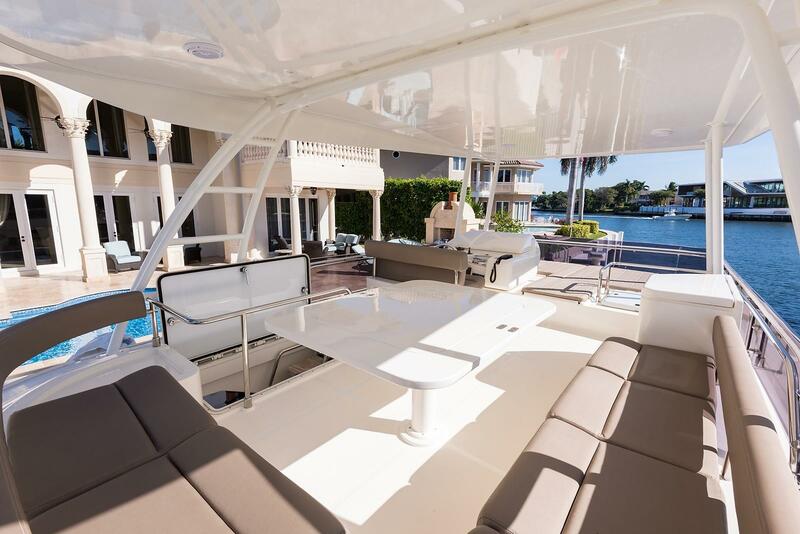 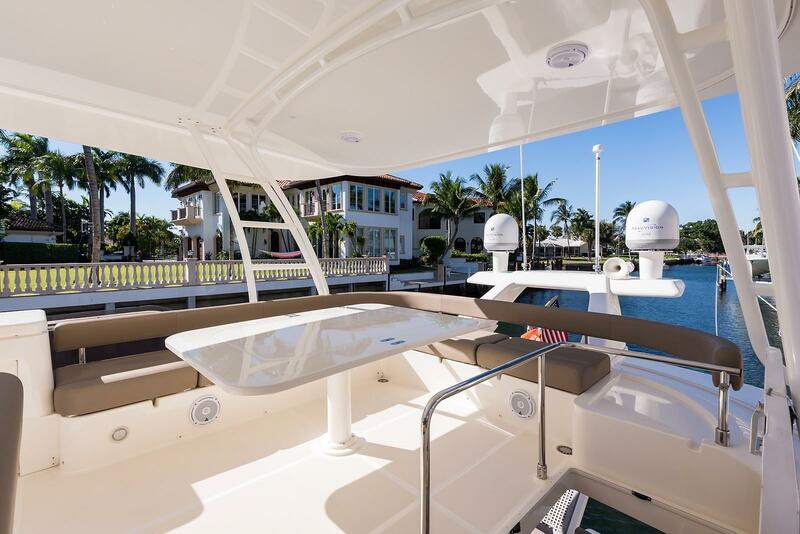 The fly bridge is accessed from the aft deck and features a custom hardtop, enclosure, retractable full helm station, and plenty of seating around an expandable table.